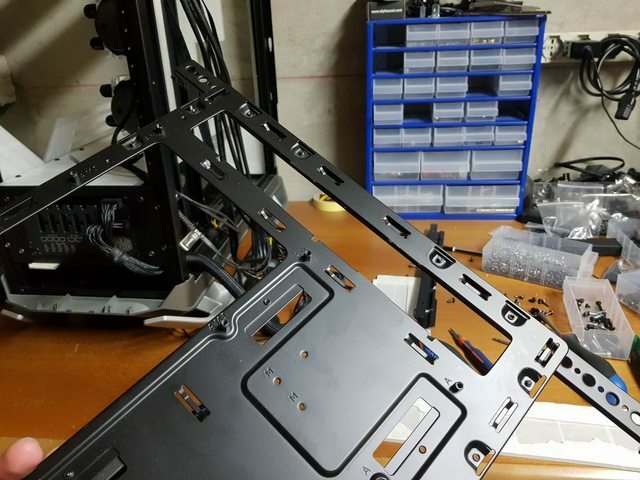 Discussion in 'Project Logs' started by SaaintJimmy, 5 Apr 2018. 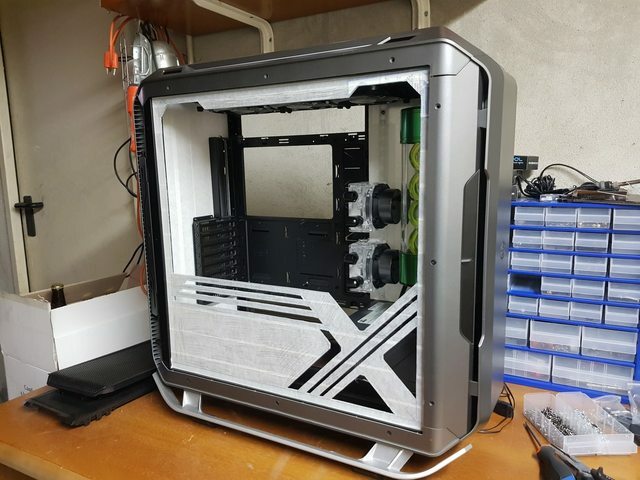 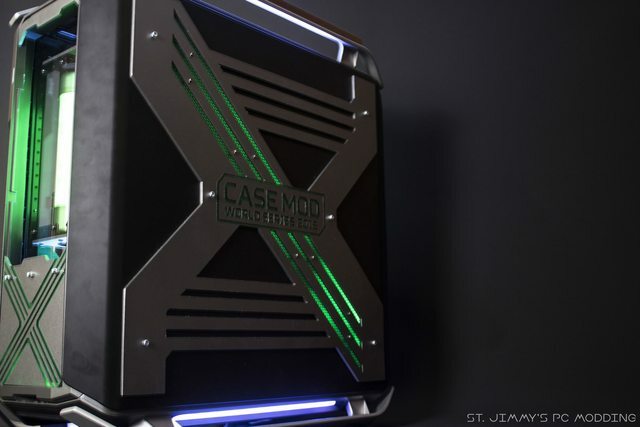 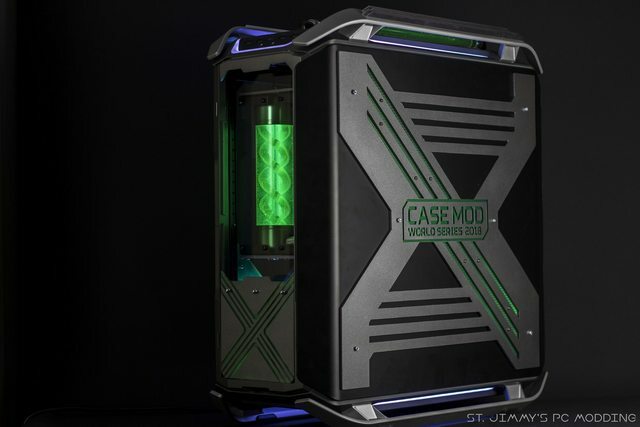 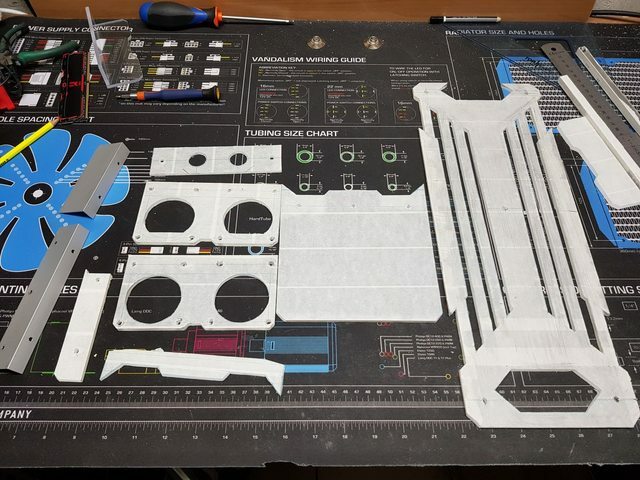 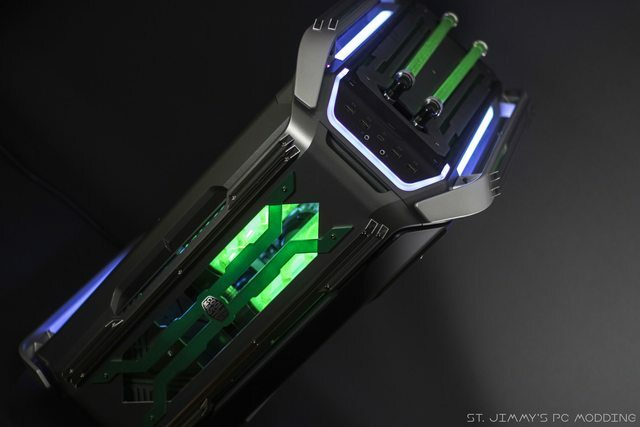 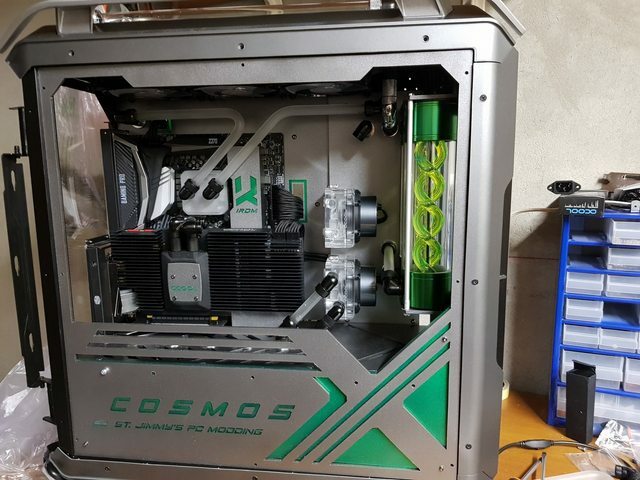 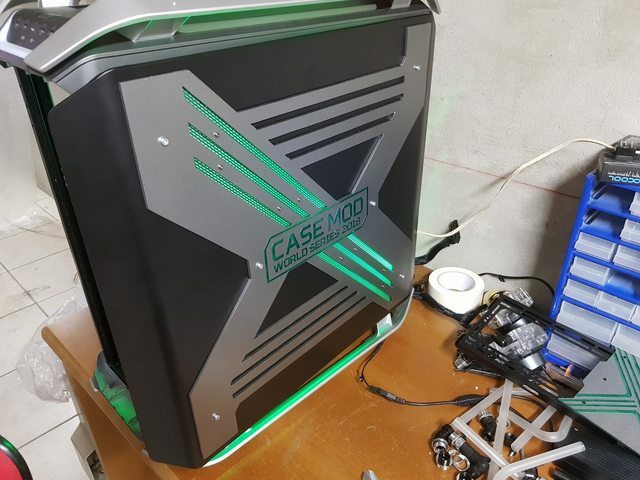 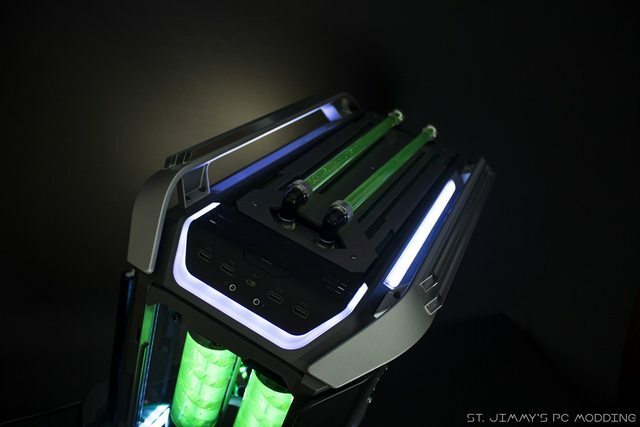 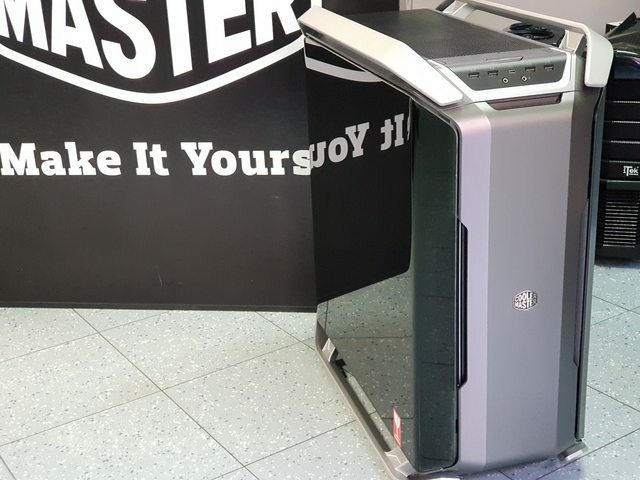 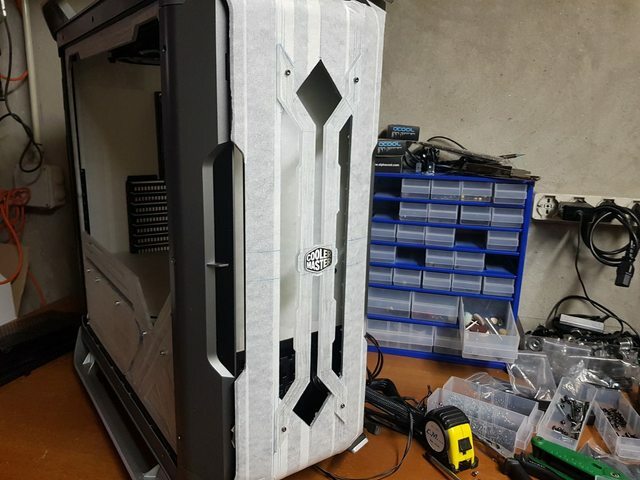 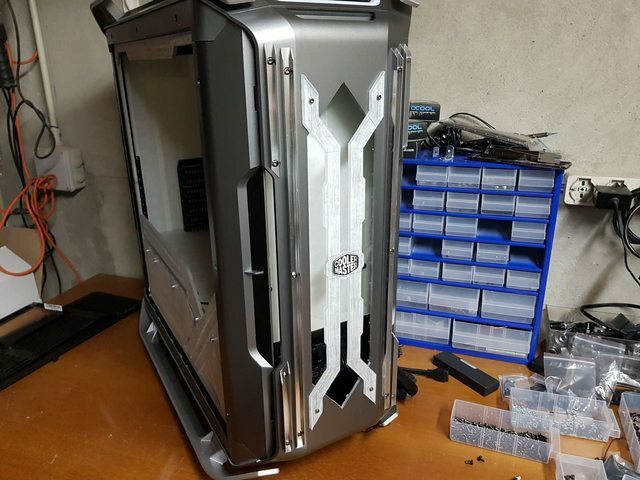 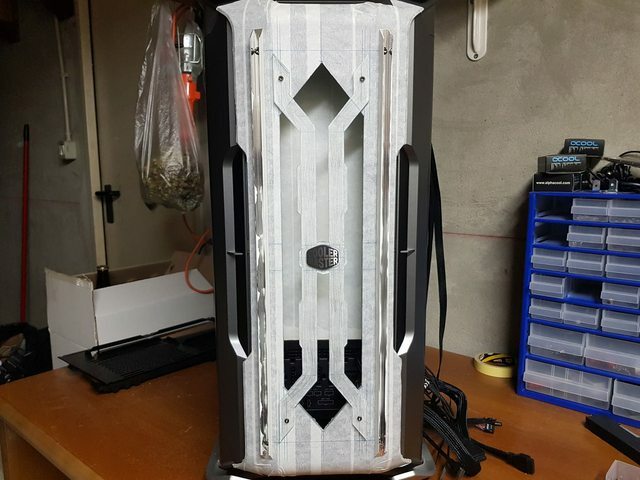 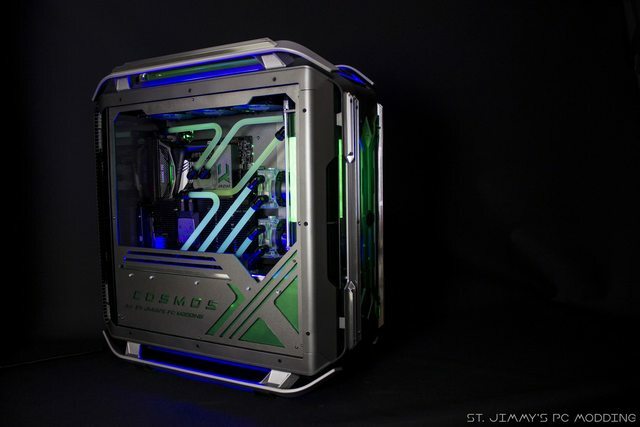 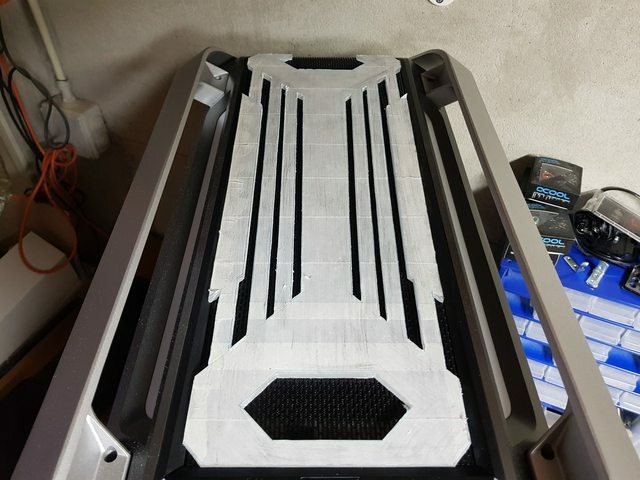 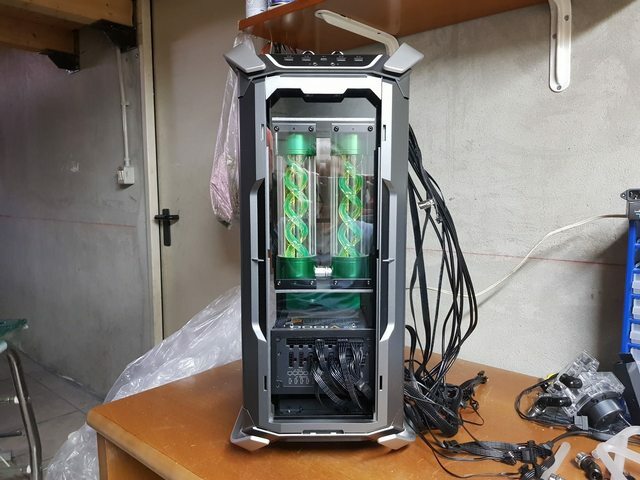 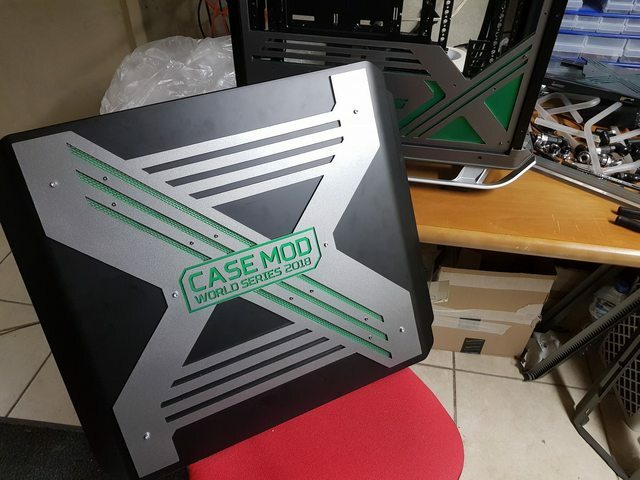 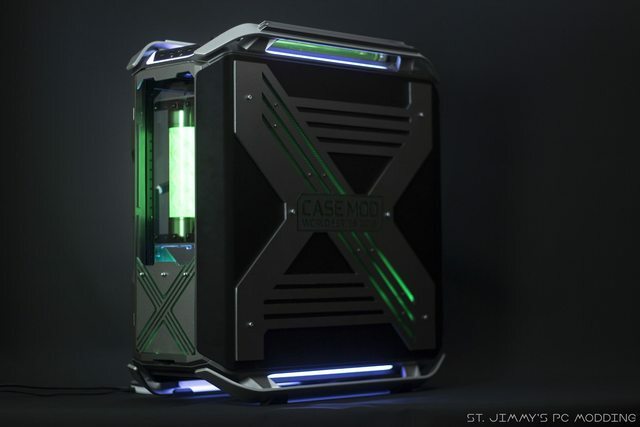 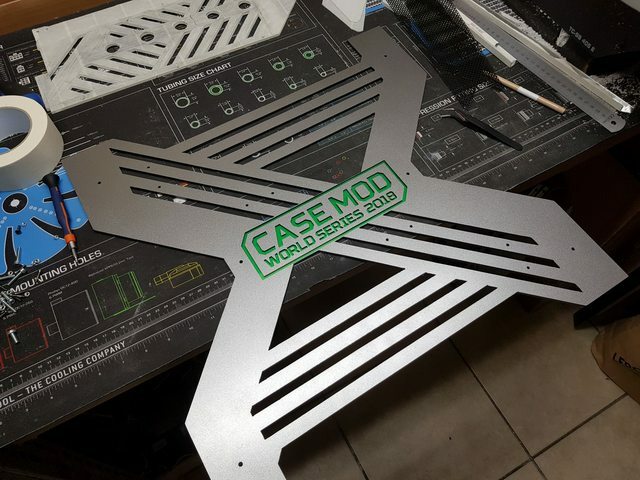 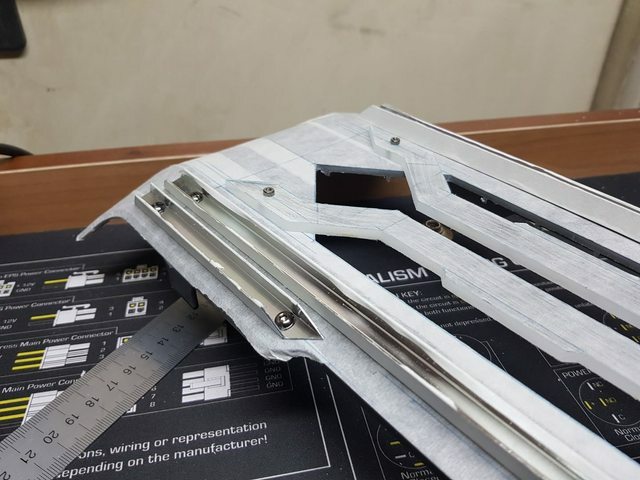 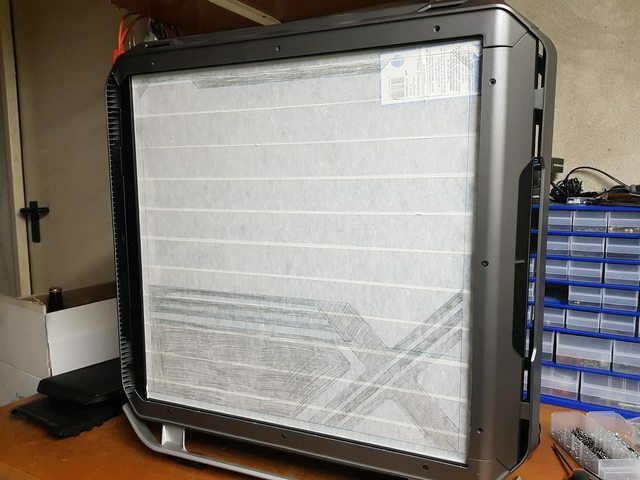 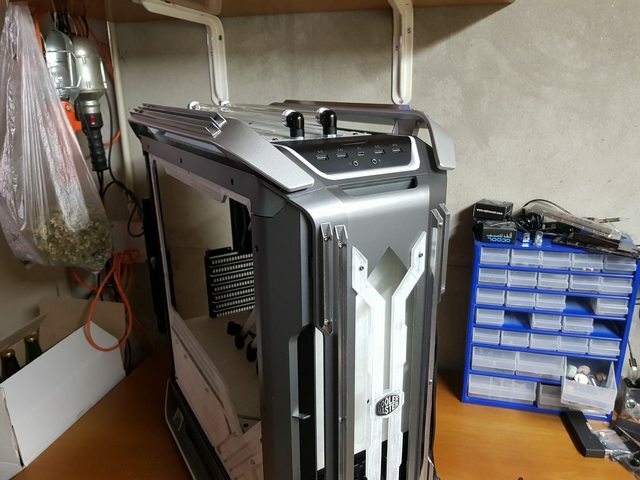 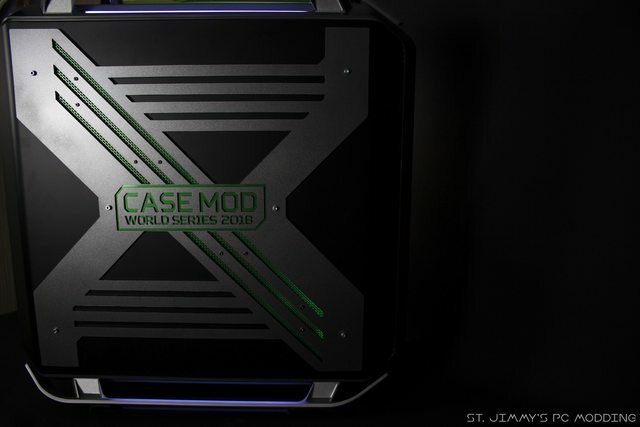 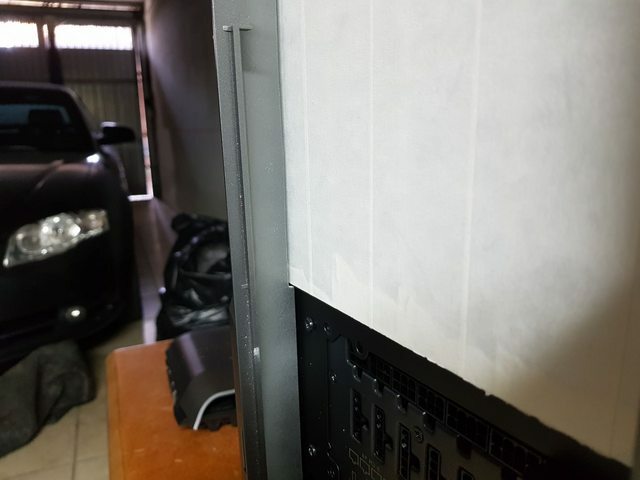 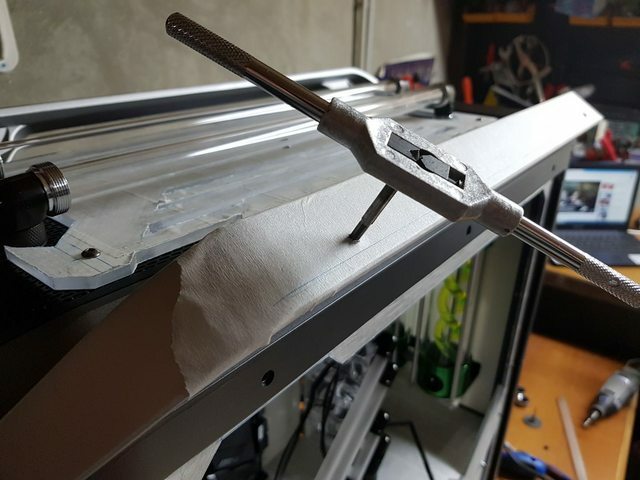 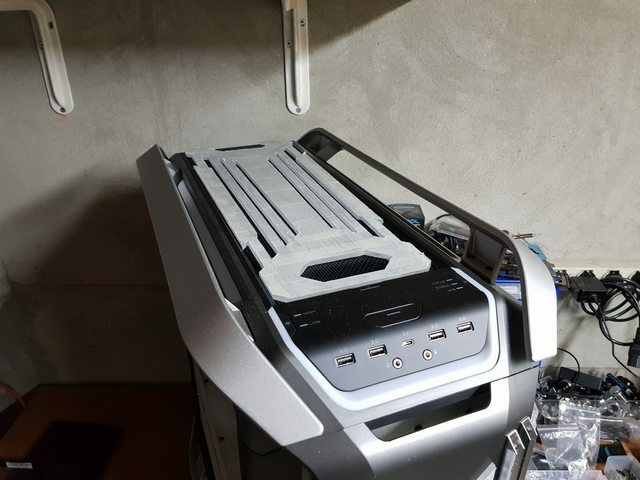 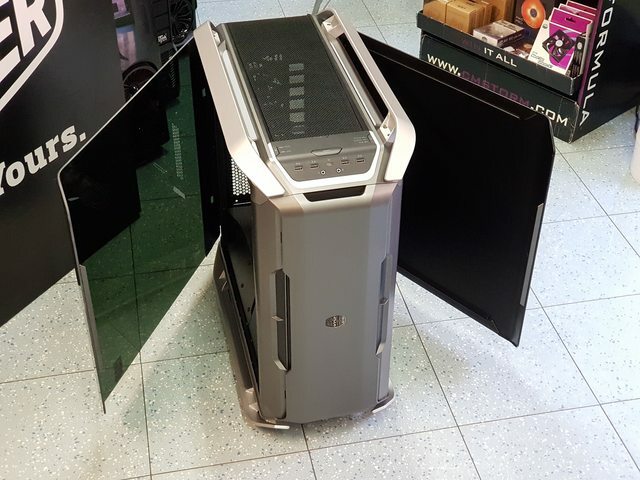 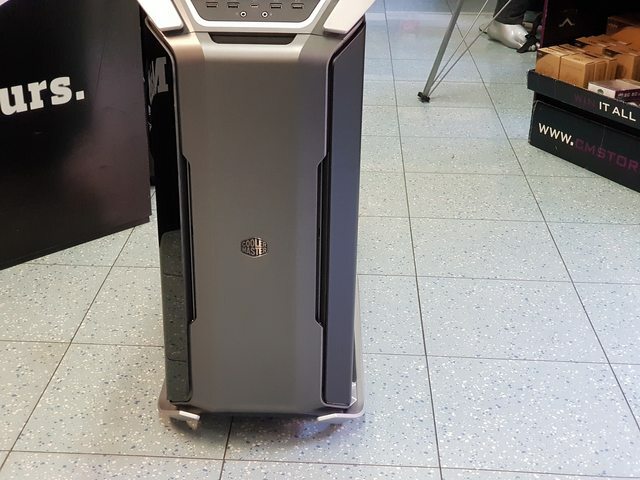 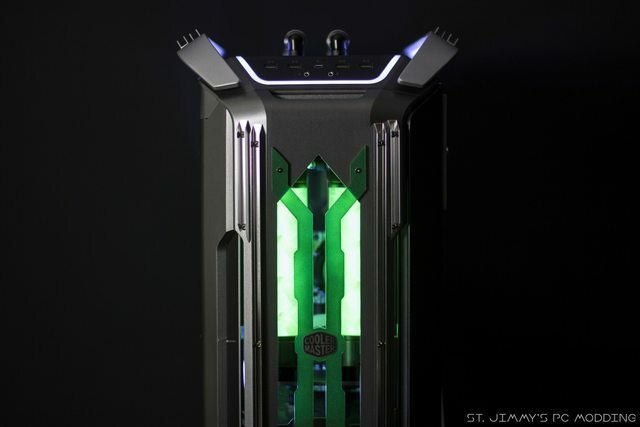 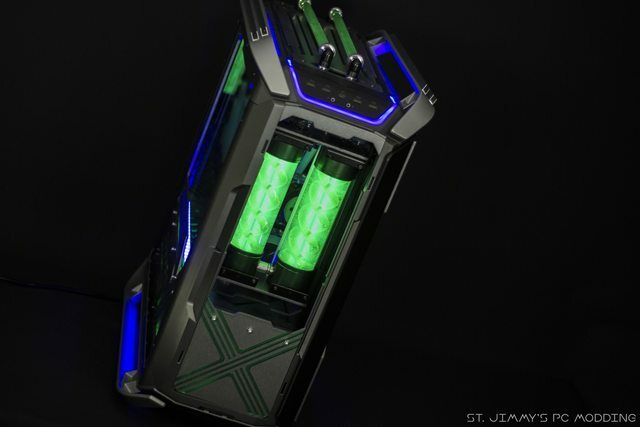 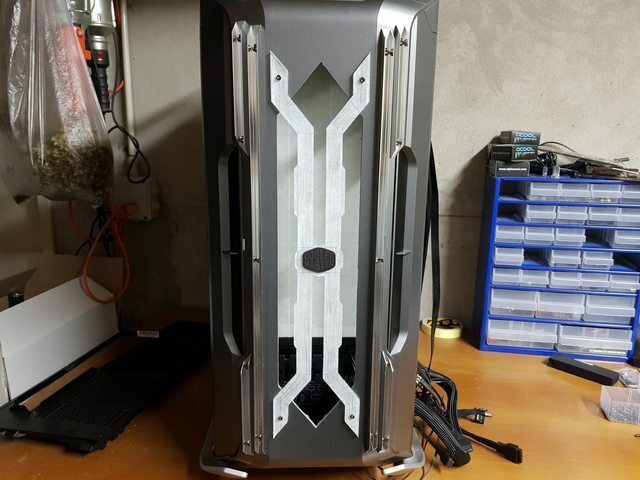 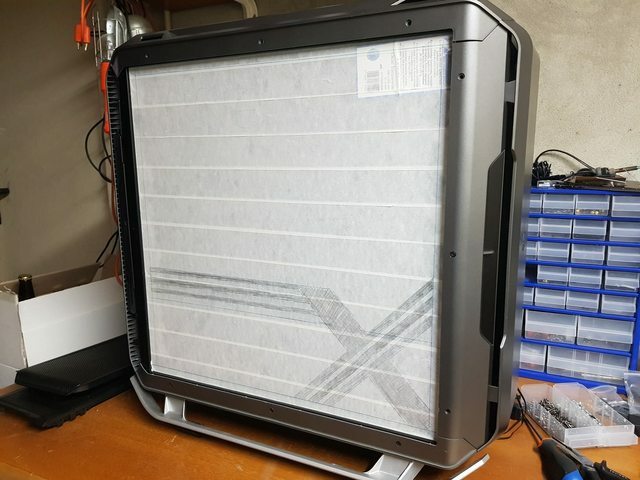 Hello everyone, today I'm here to present a new project I'll be competing with in the Coolermaster Case Mod World Series 2018. 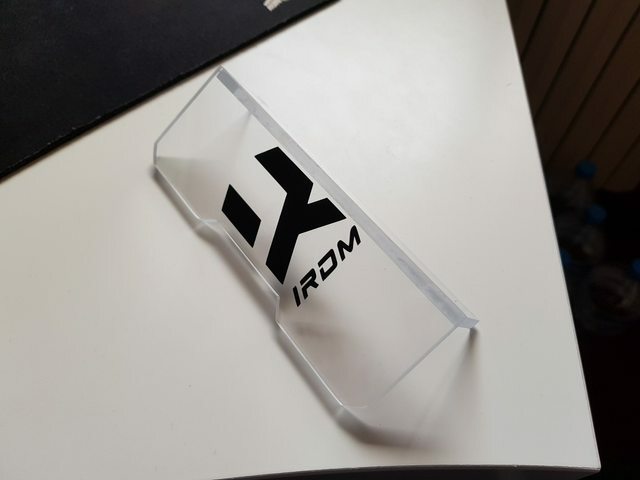 Some of you may think this will be like a space-theme given the similarity with the name SpaceX, Elon Musk's airspace company. 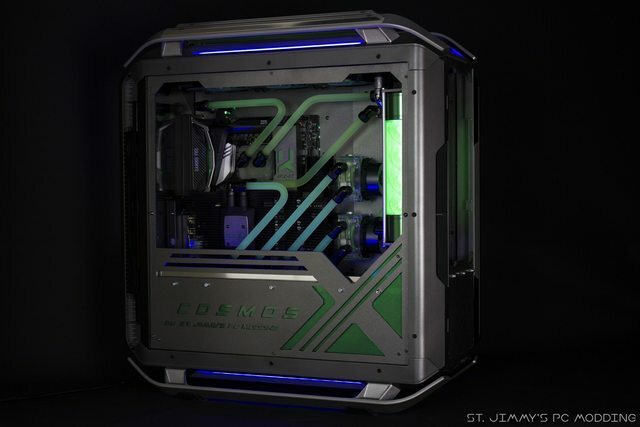 That's not completely true, as this will be a green/grey/black mod and will only have little to no space references. 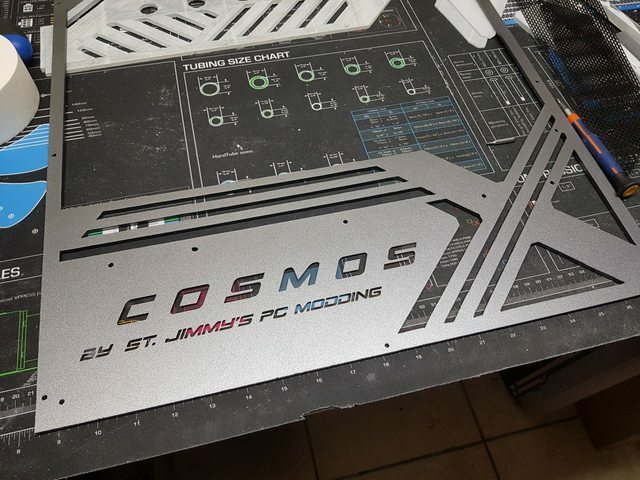 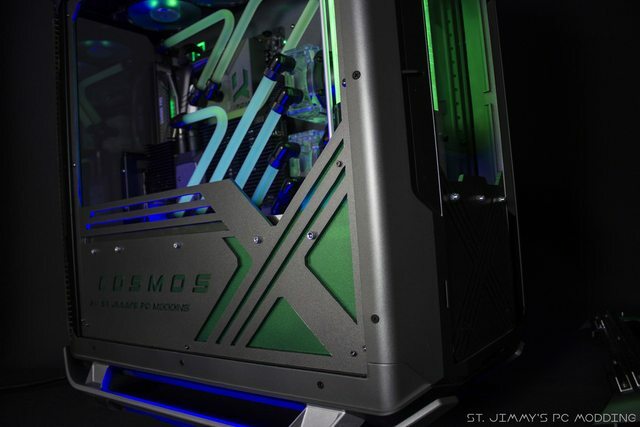 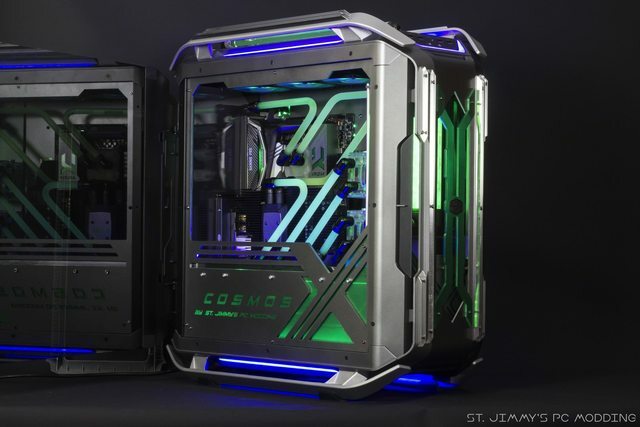 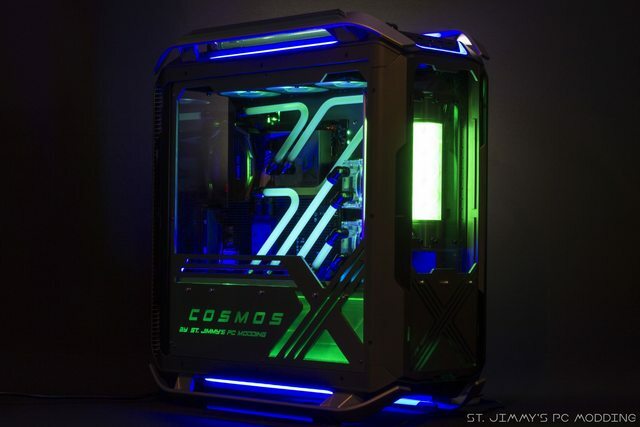 I chose this name because I personally am a fan of everything related to space, and I found "CosmosX" fitting with the mod because, if you look at the front of the C700P, it actually looks sort of X shaped. 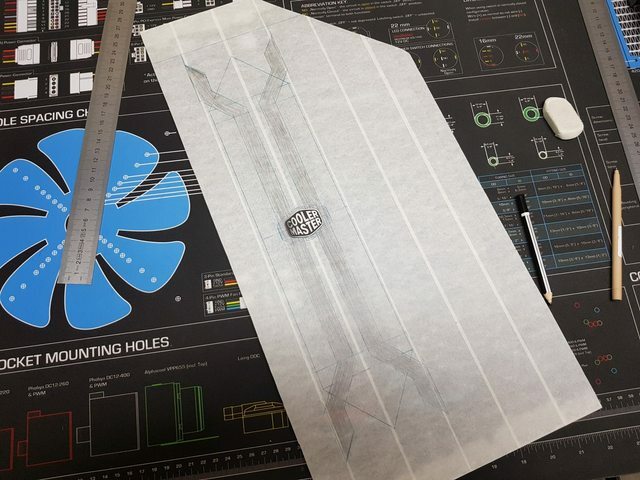 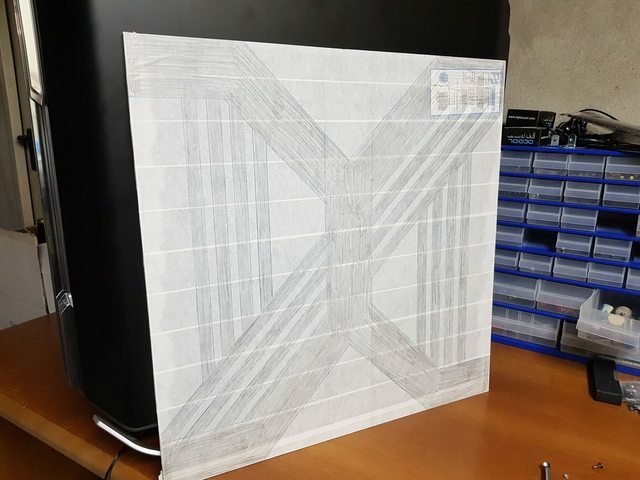 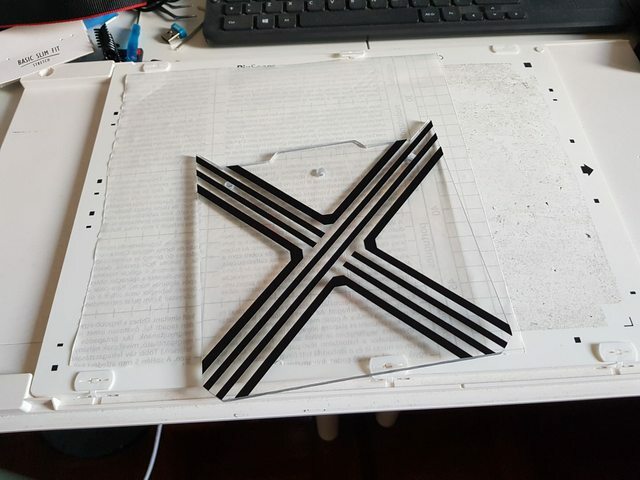 So I will start from there, shaping the entire mod using that concept, the X lines. 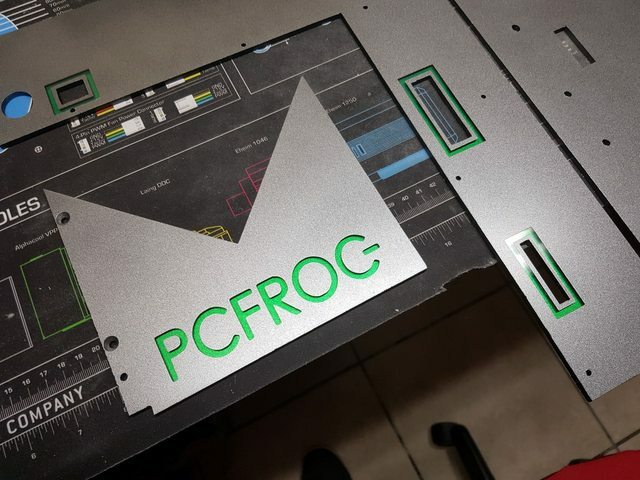 This is a mod that will go on display at the PC Frog store, so thanks to them for giving me the opportunity to make this project and for gathering two great sponsors together, Coolermaster and MSI. 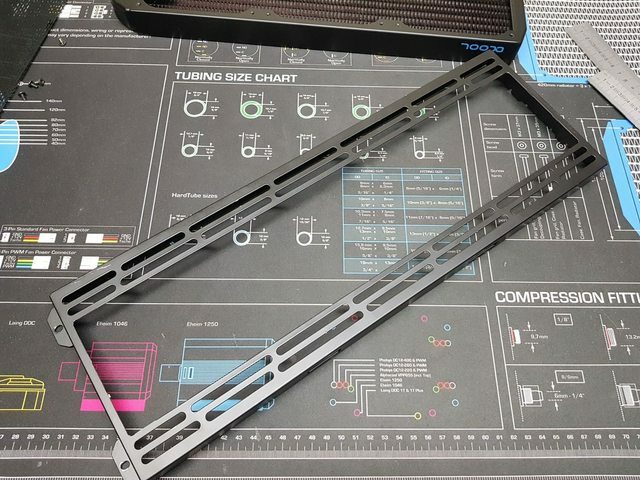 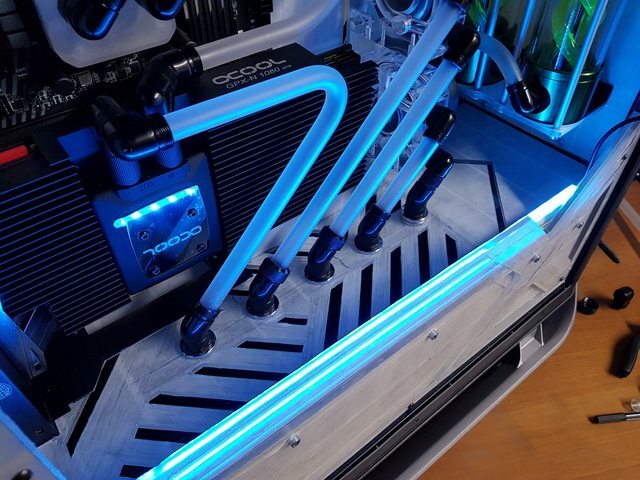 Also thanks to Aquatuning and Alphacool which are always available to support me in my projects! 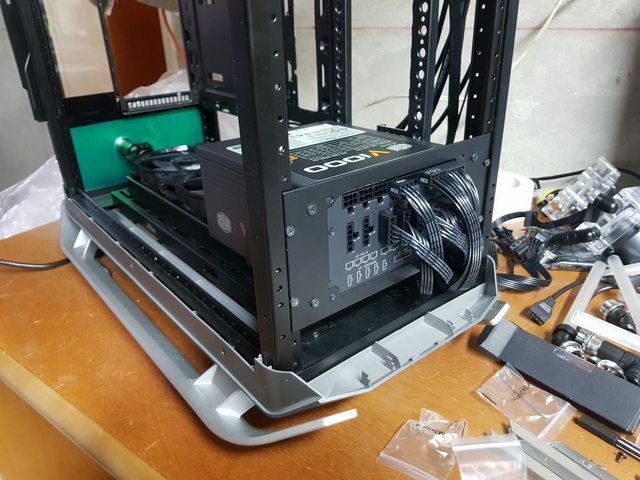 So let's start by tearing down almost the entire case. 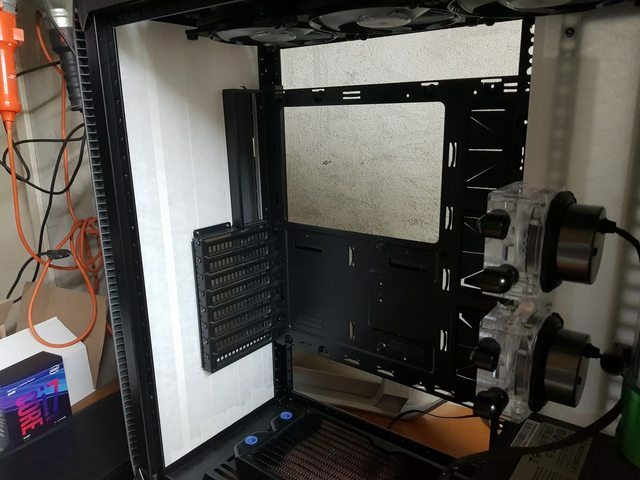 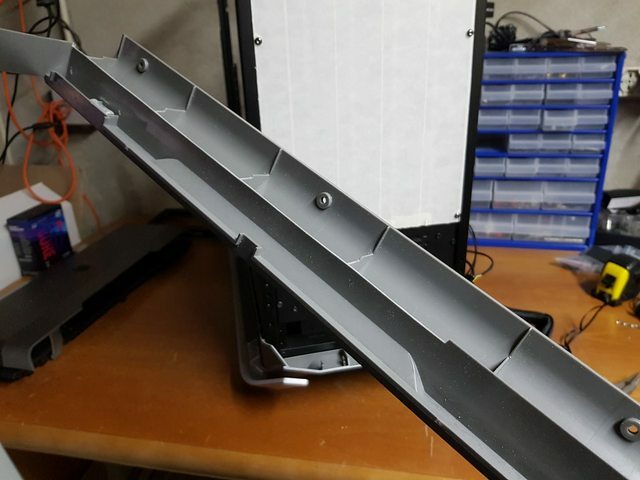 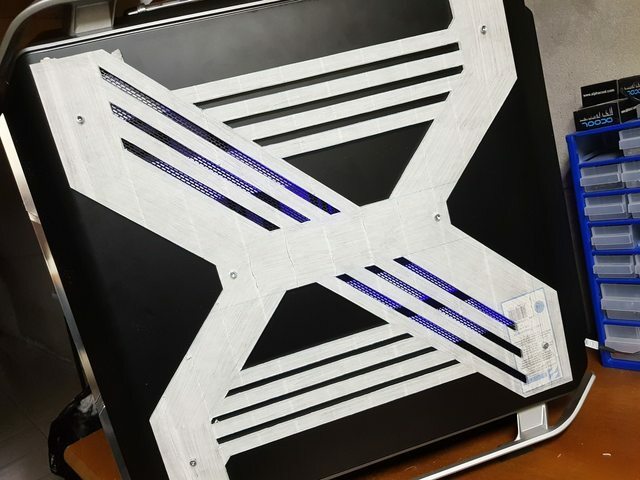 Since this is a really beautiful case by default, I found myself in a hard time trying to find an original layout, so the first days was pretty much entirely spent staring at it and trying some mounting for all the brackets. 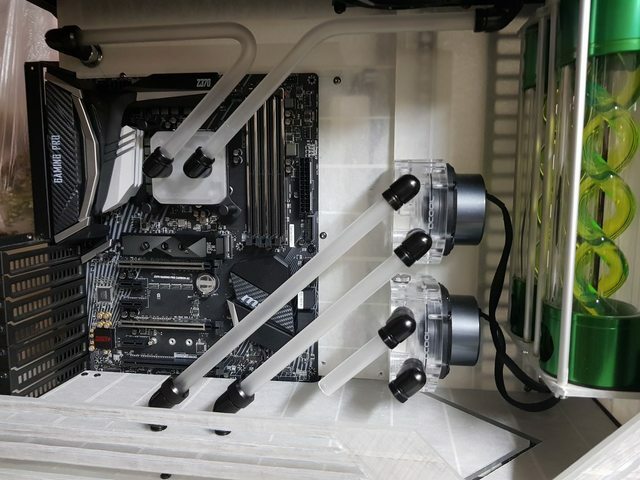 This is what I came up with: standard orientation for the mb (even do I can choose to mirror this and do a reverse), which is centered to allow the mounting of two 360 rads on top and bottom. 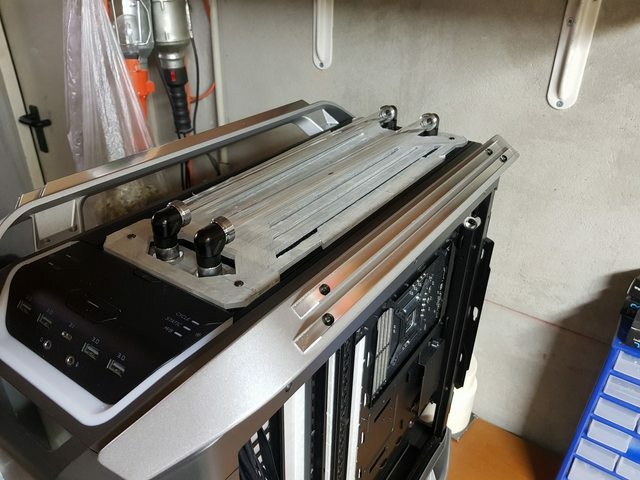 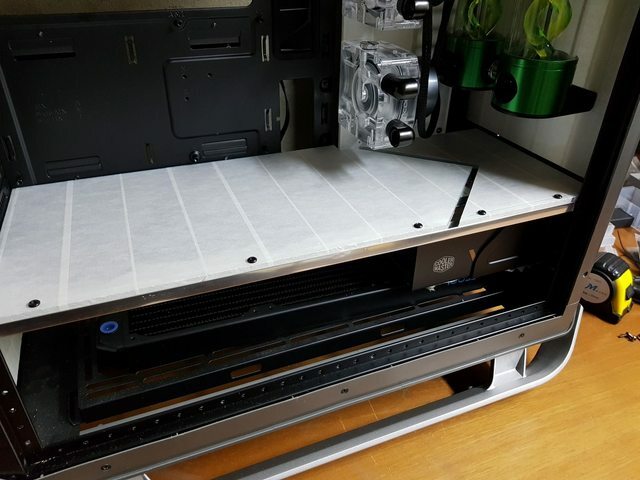 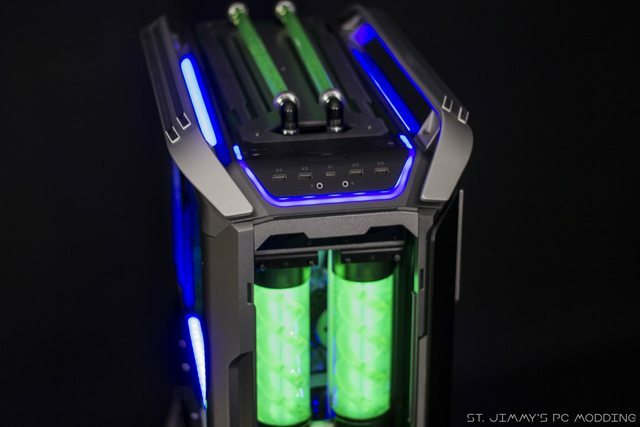 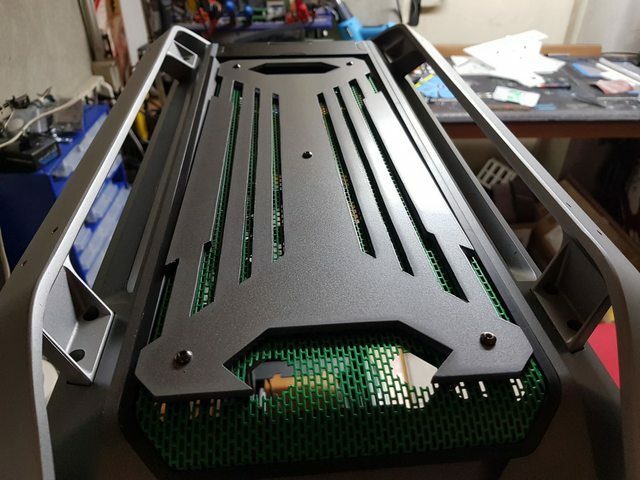 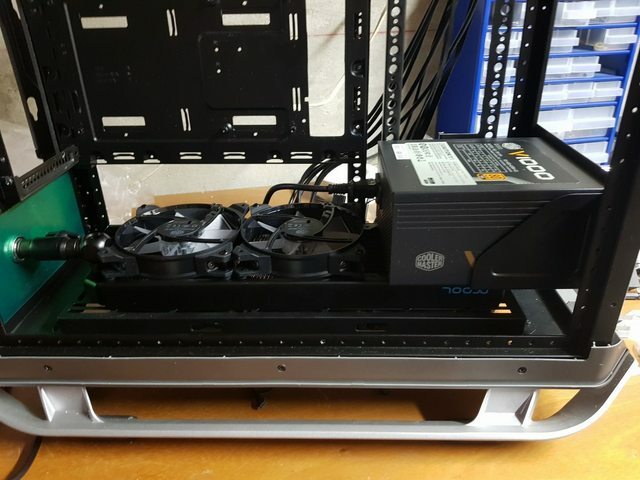 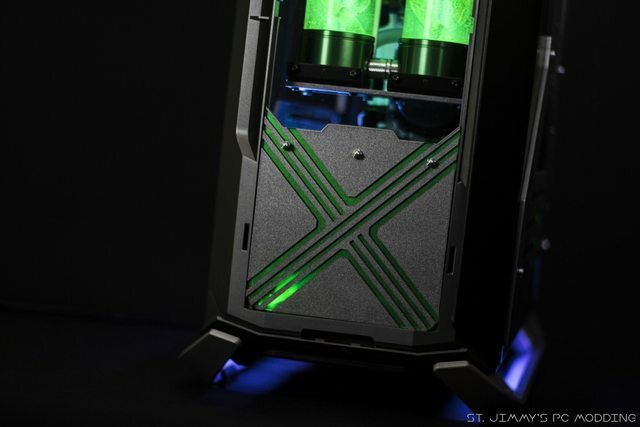 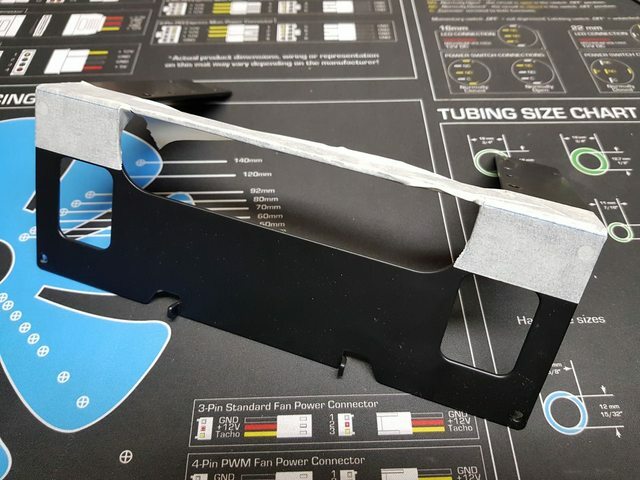 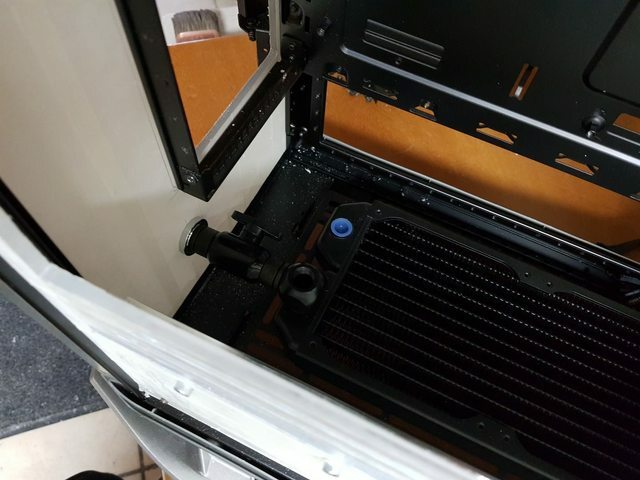 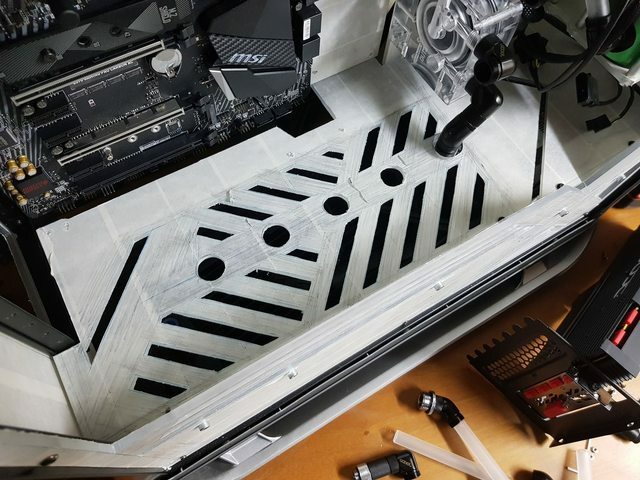 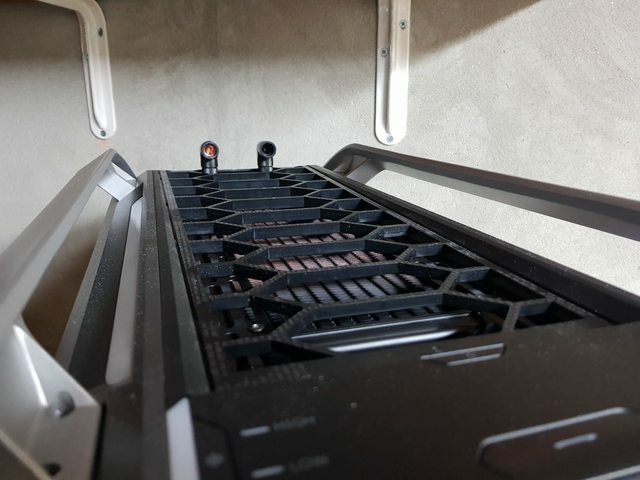 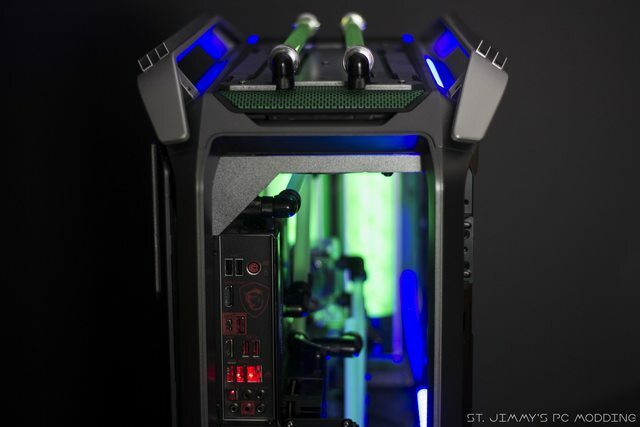 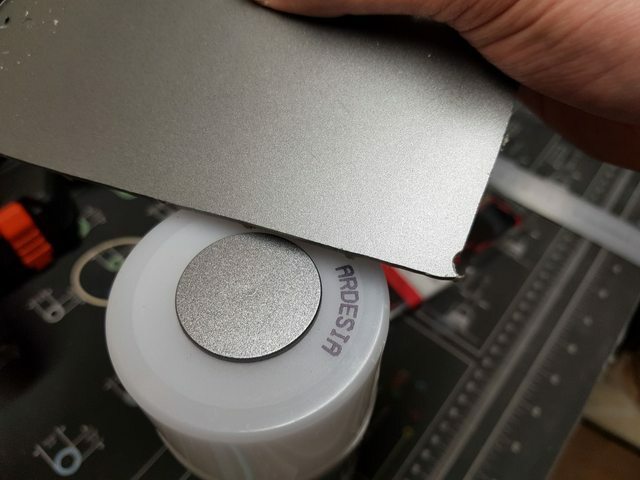 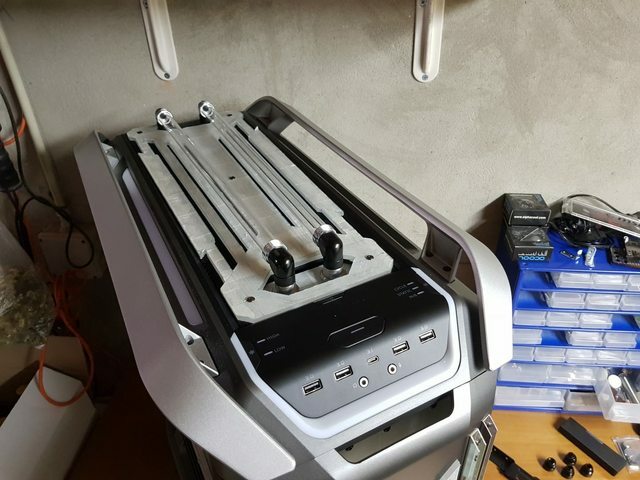 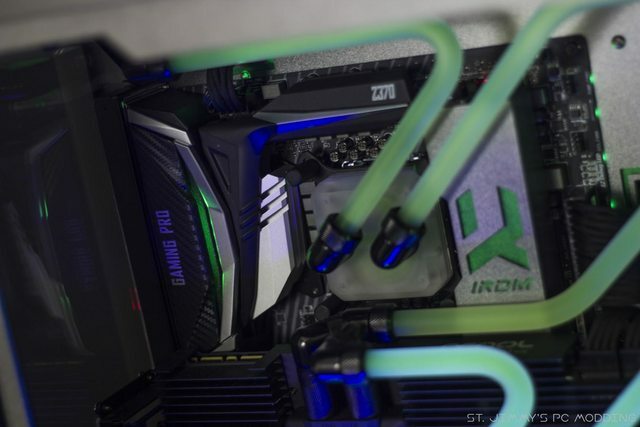 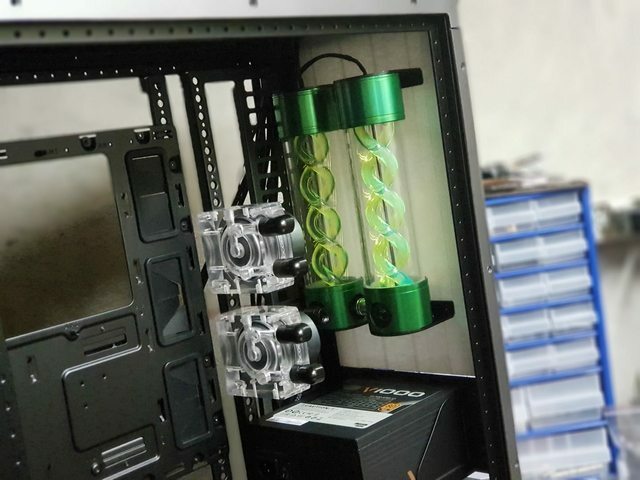 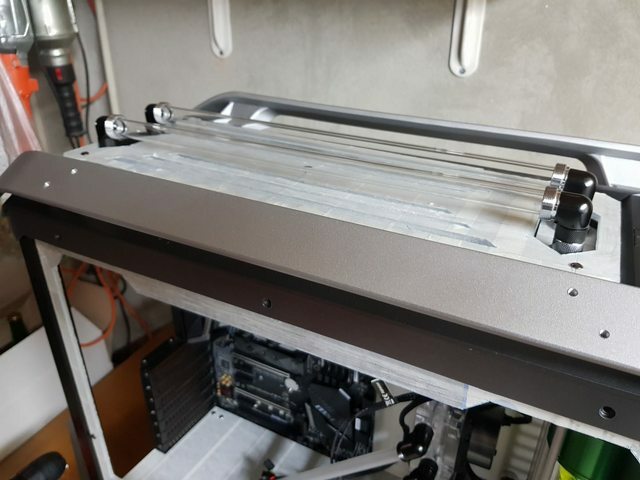 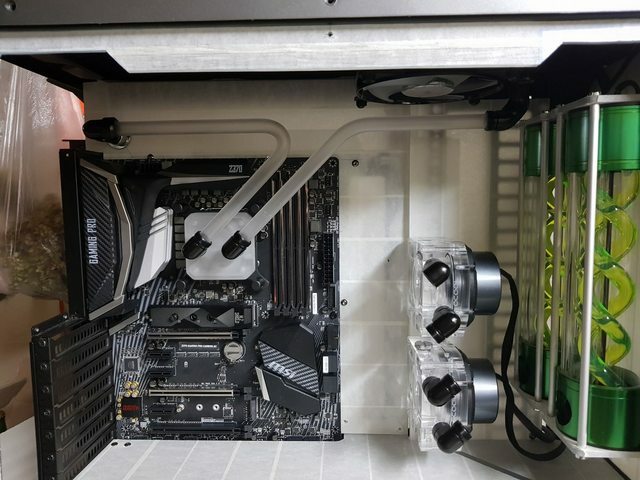 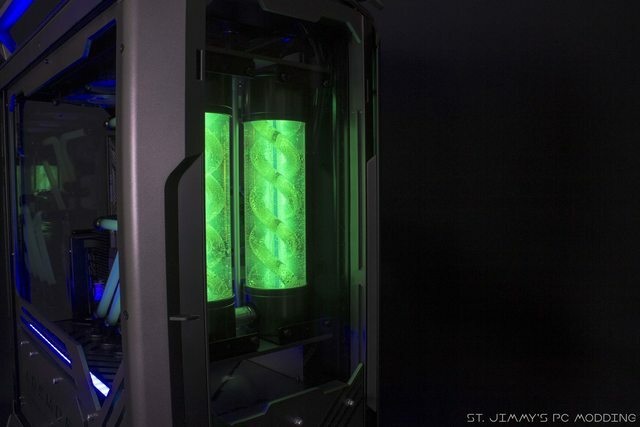 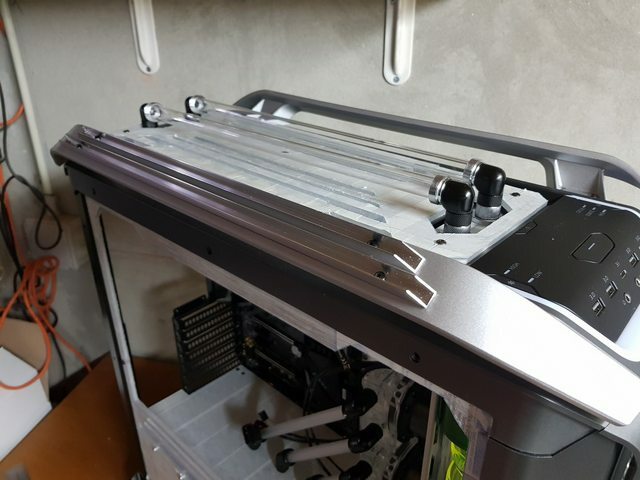 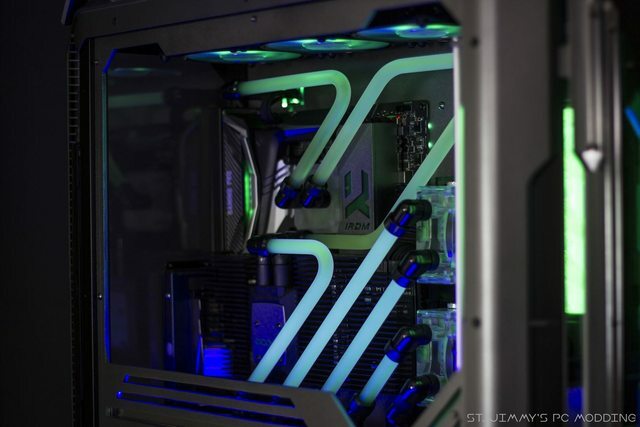 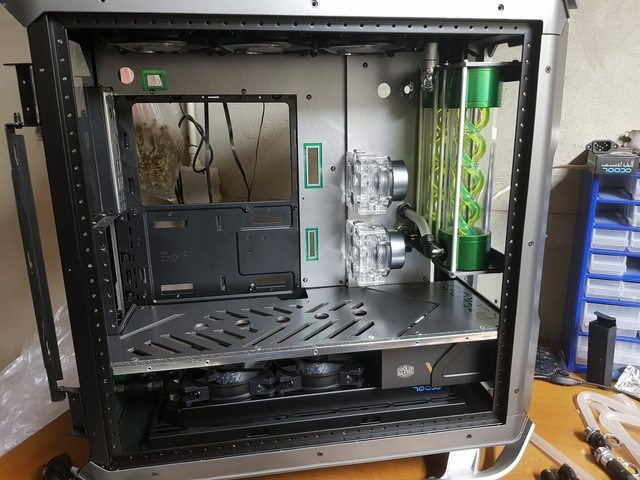 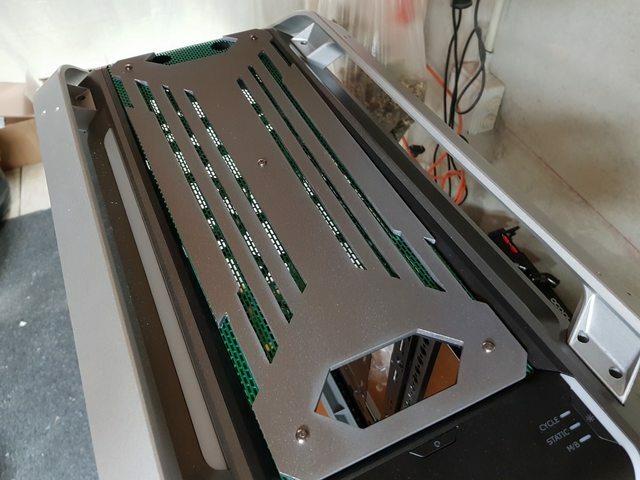 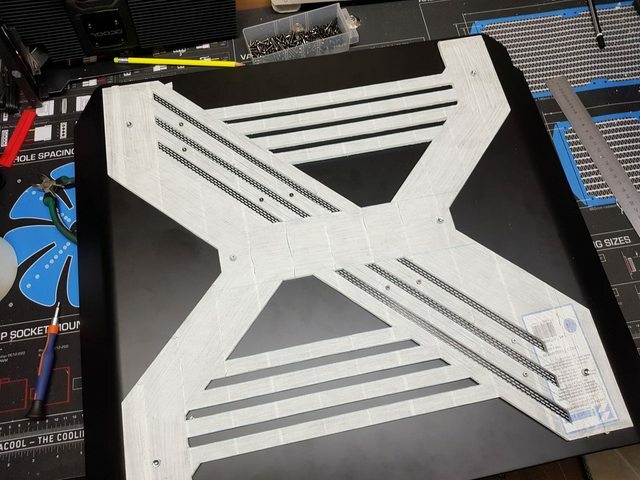 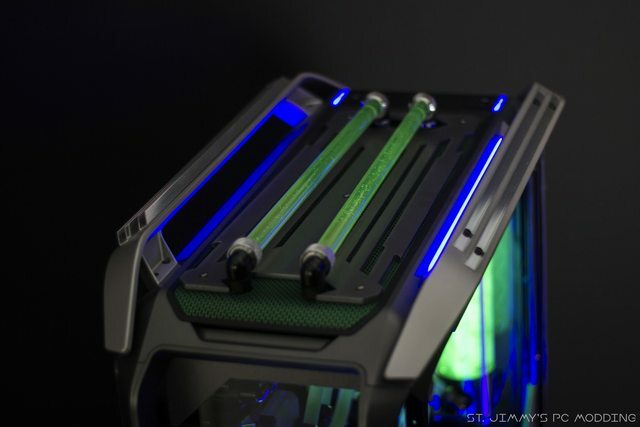 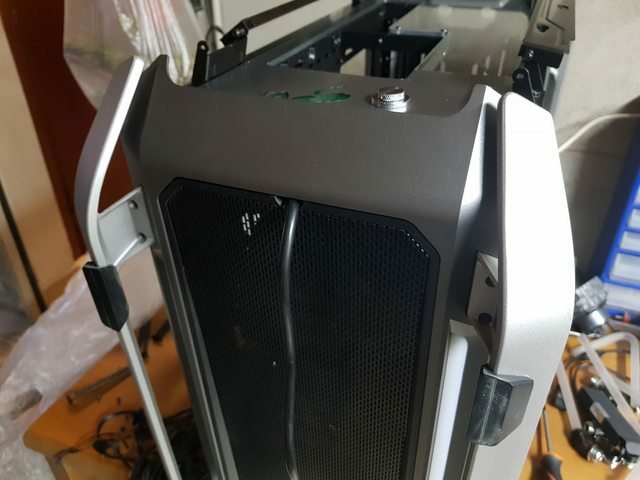 Pretty unique feature, the PSU will be mounted frontally, to allow the bottom rad to be mounted. 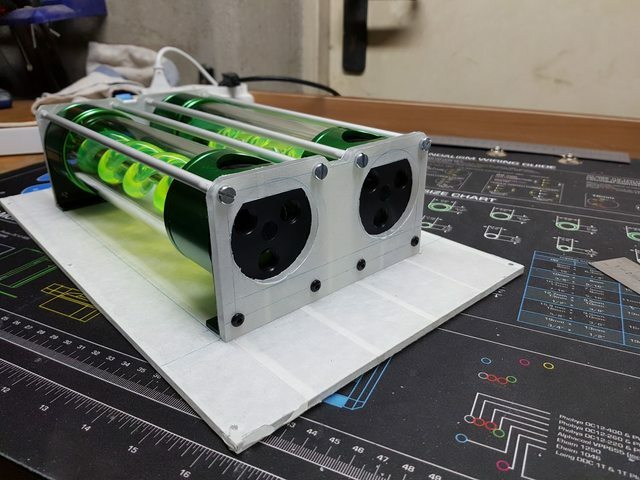 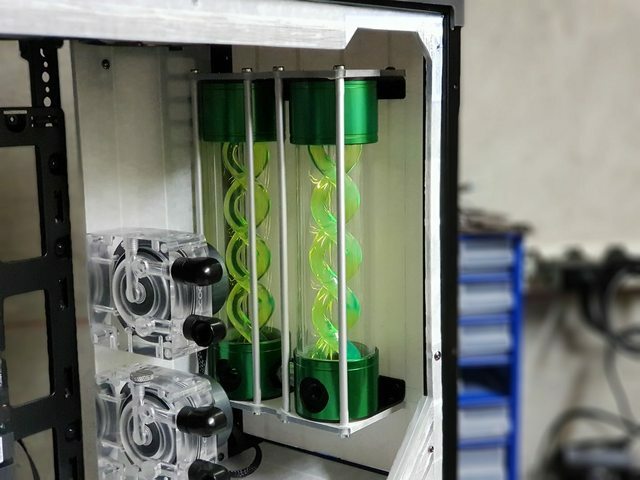 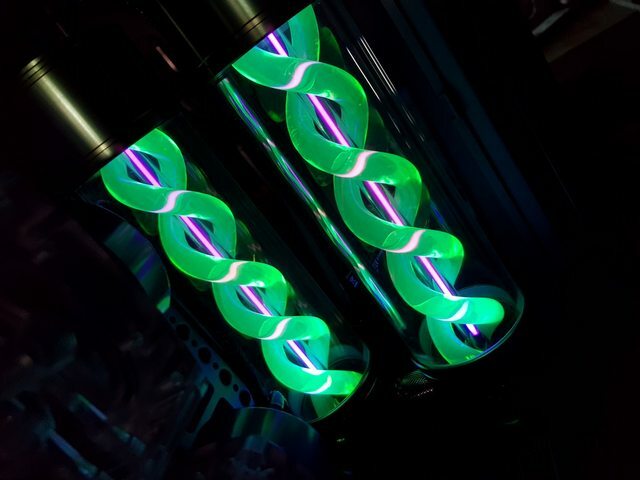 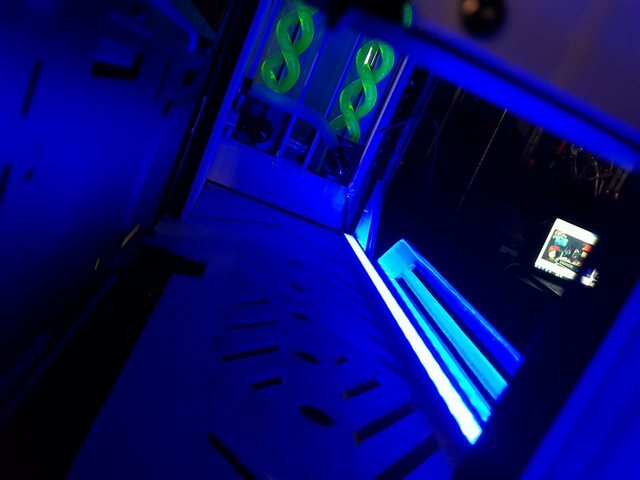 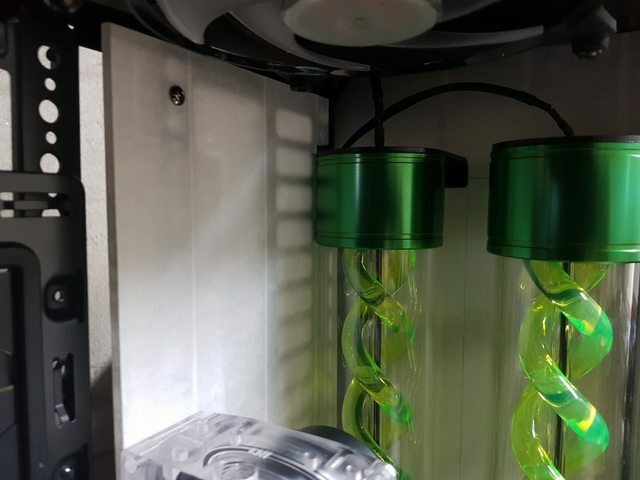 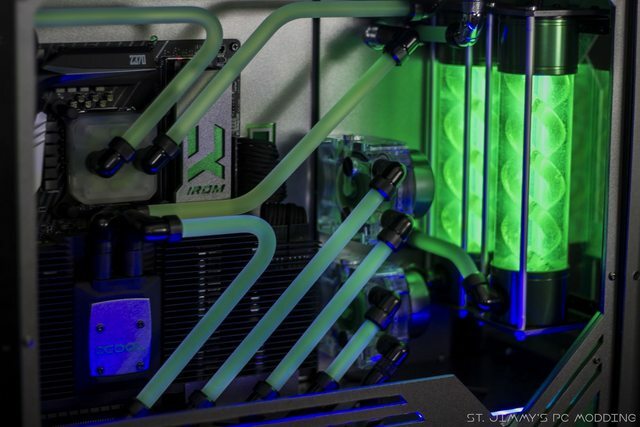 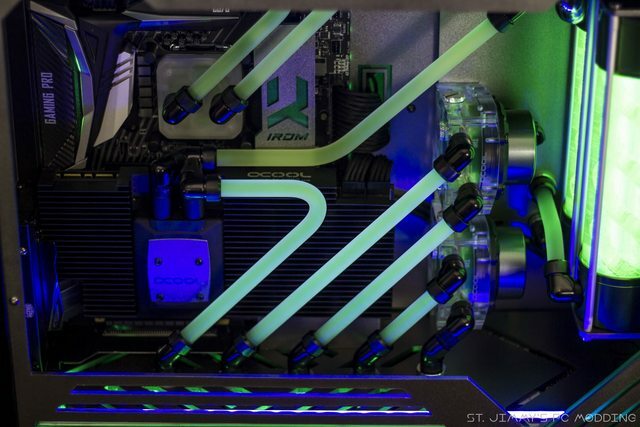 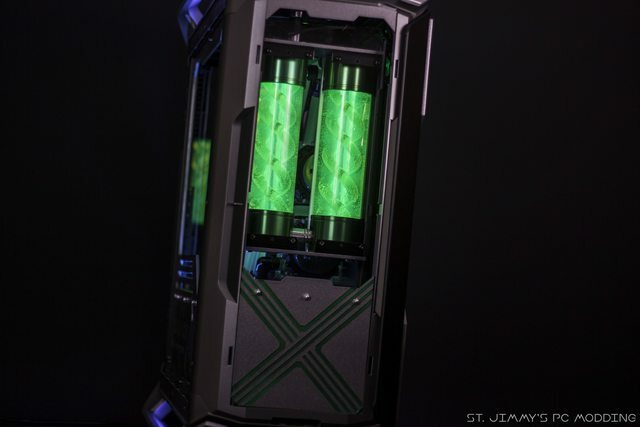 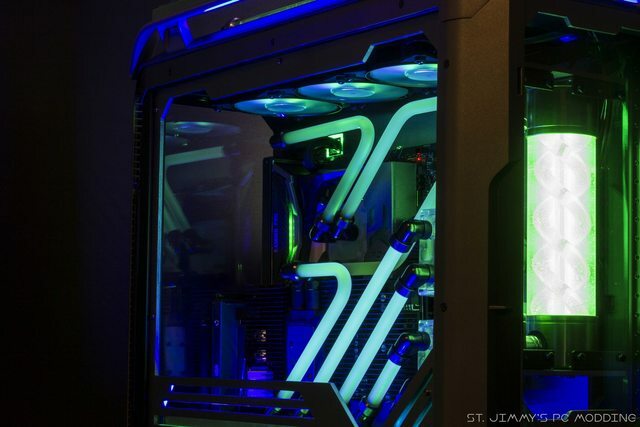 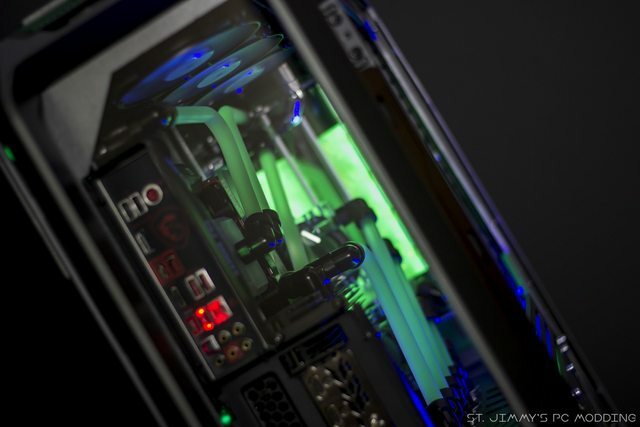 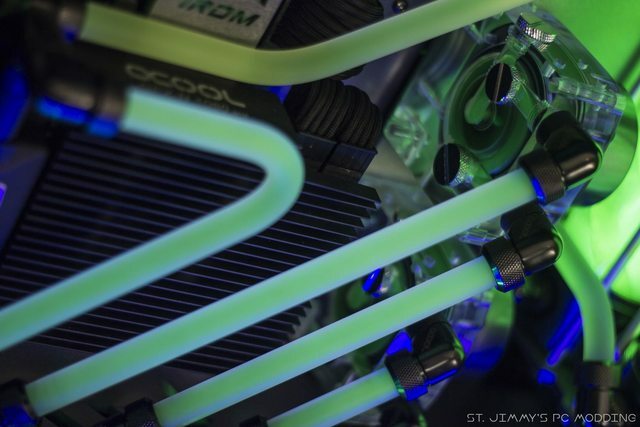 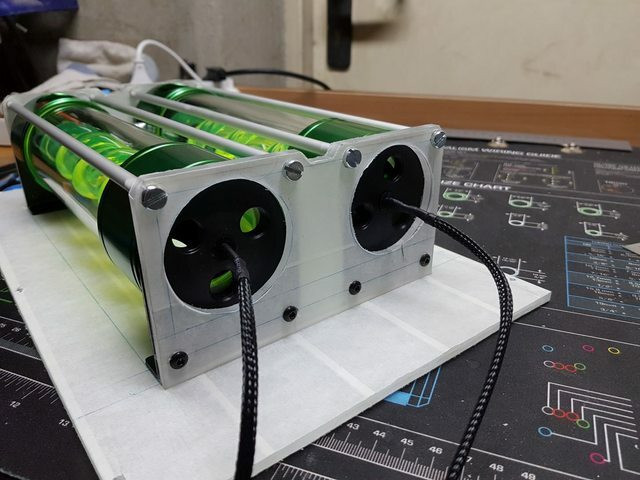 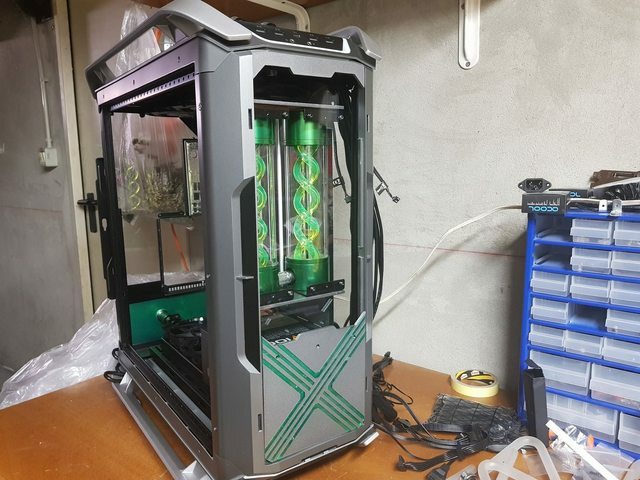 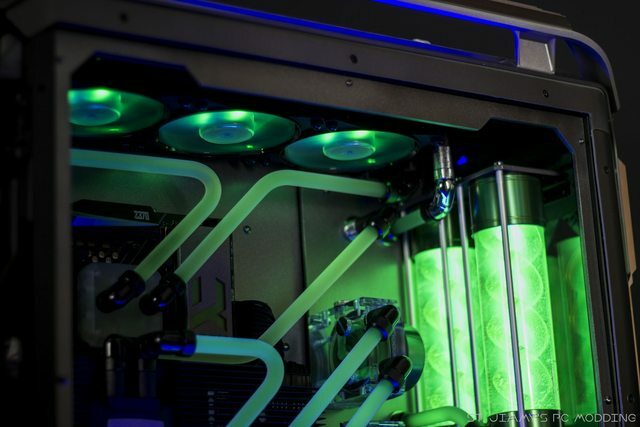 Alphacool Eisbecher Helix Green in all their beauty! 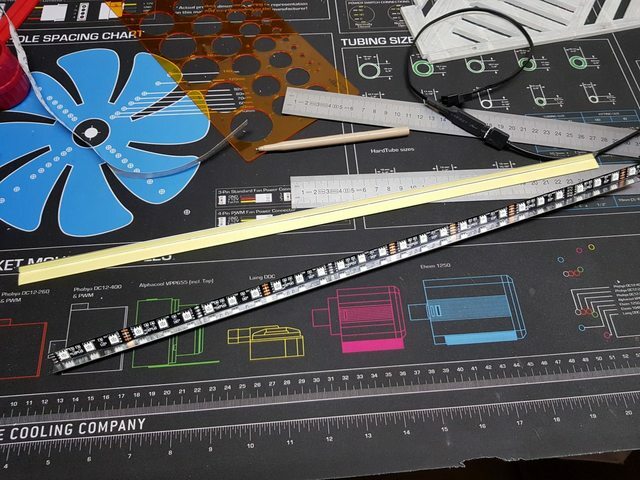 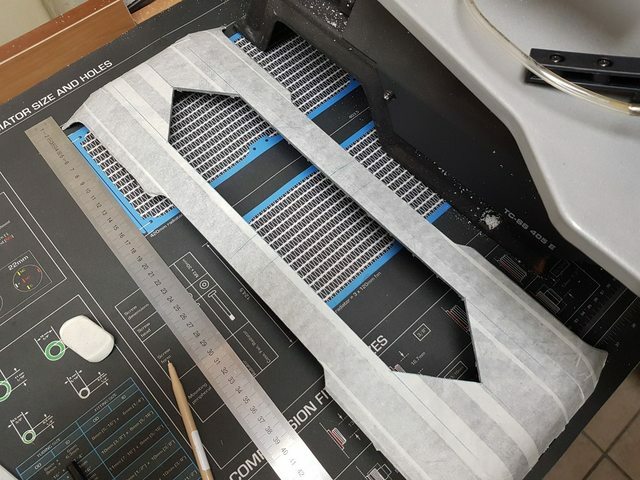 Some cuts to make everything fit properly. 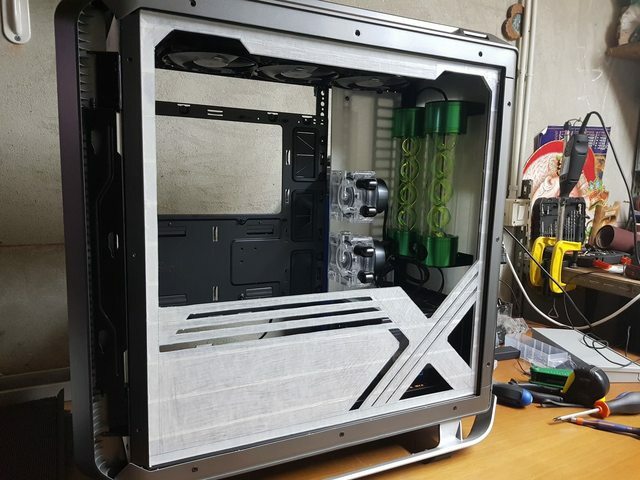 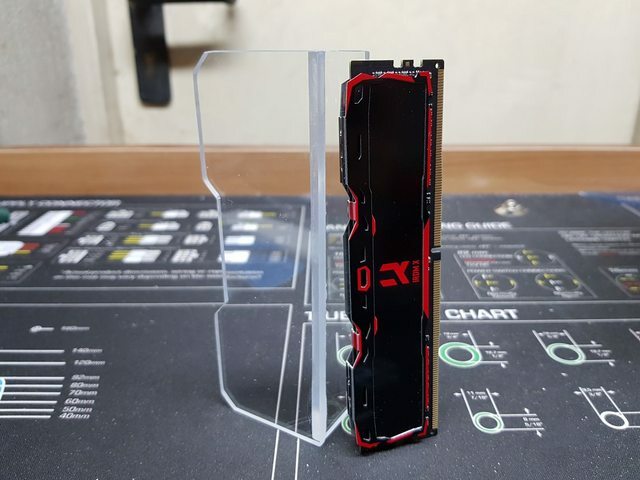 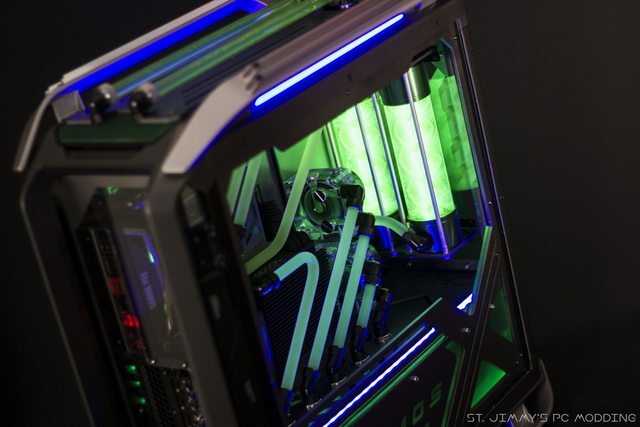 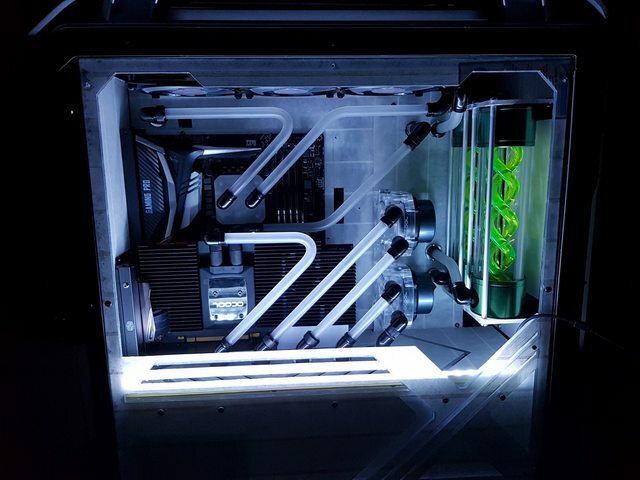 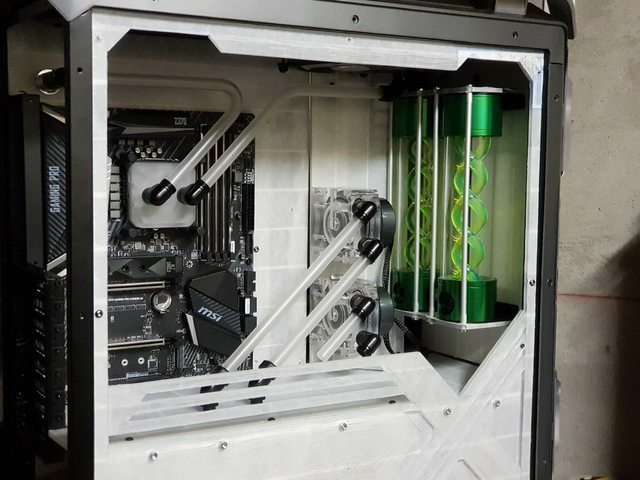 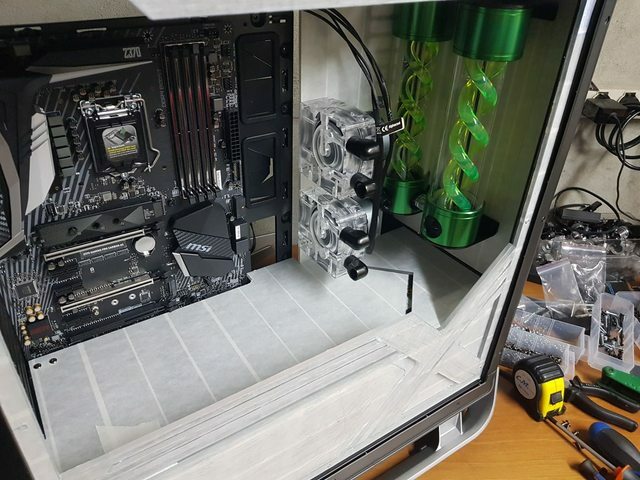 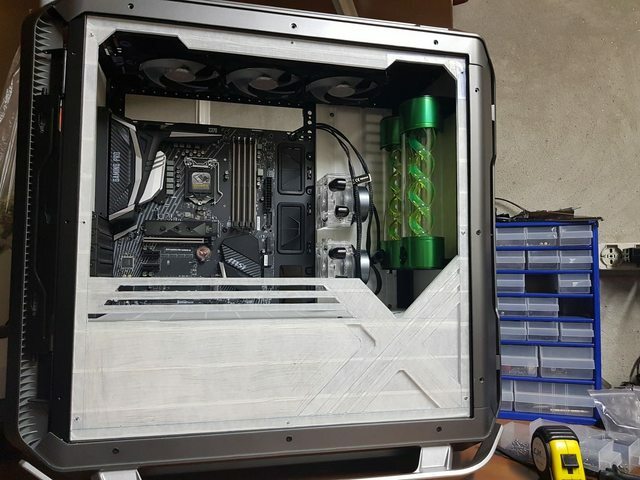 Acrylic panels at the back and front for a clear view of the internals. 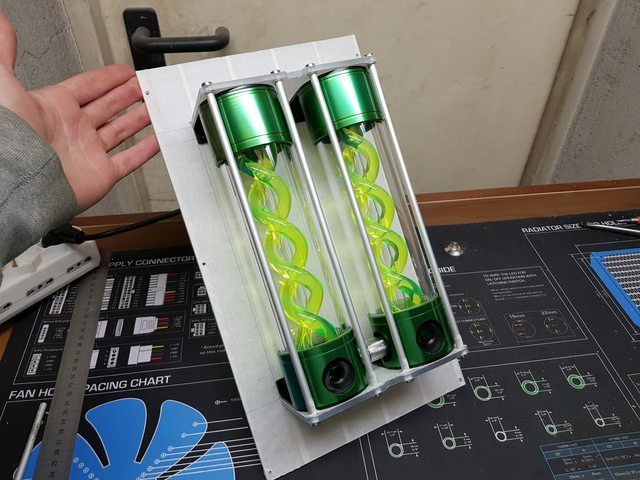 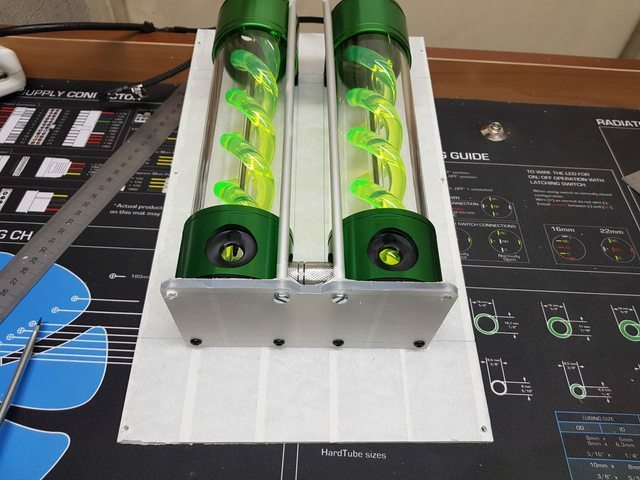 Reservoirs and pumps mounted on the acrylic panels. 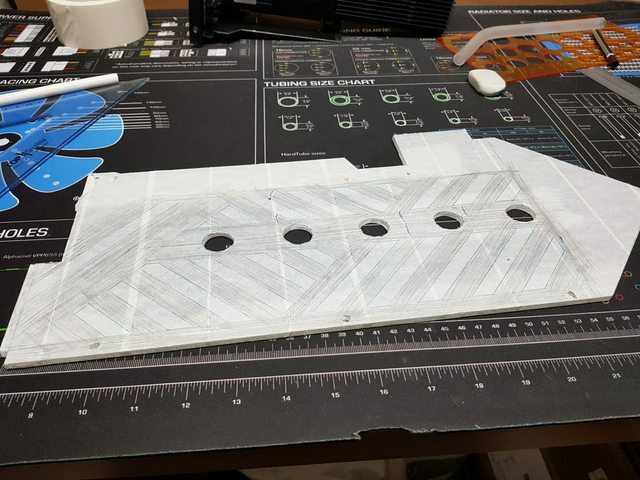 Now to the side cover and midplate. 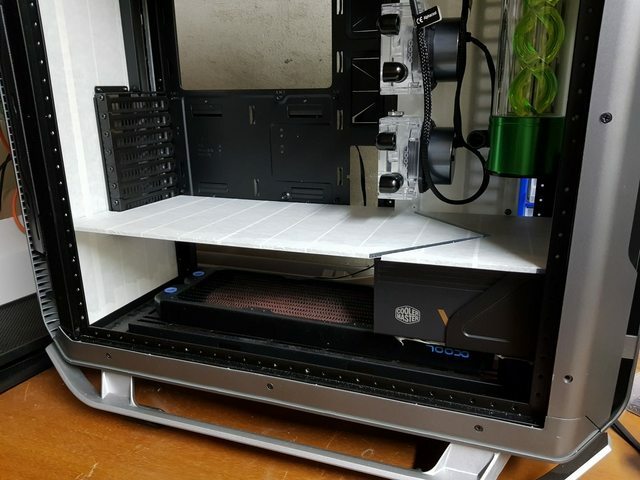 Nice start. 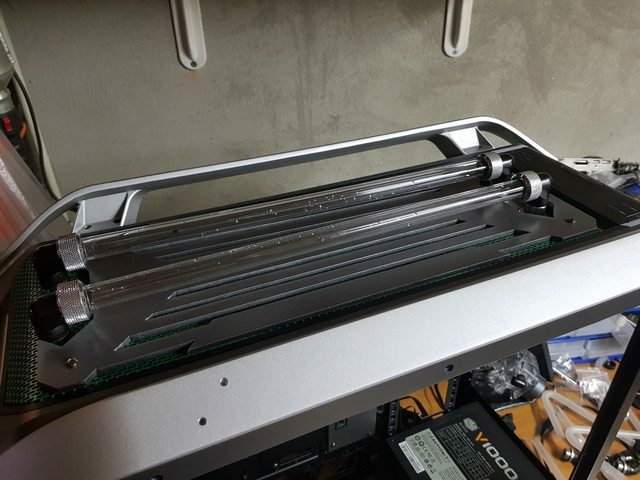 At first I was wondering where you were putting radiators, then I saw them. 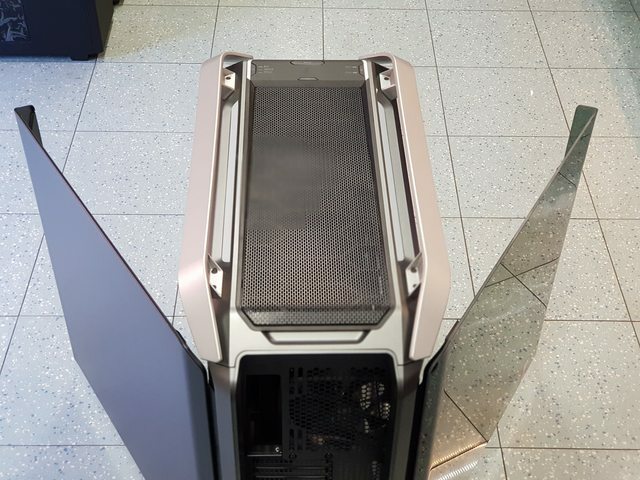 Good Lord, the size of this case sneaks up on you. 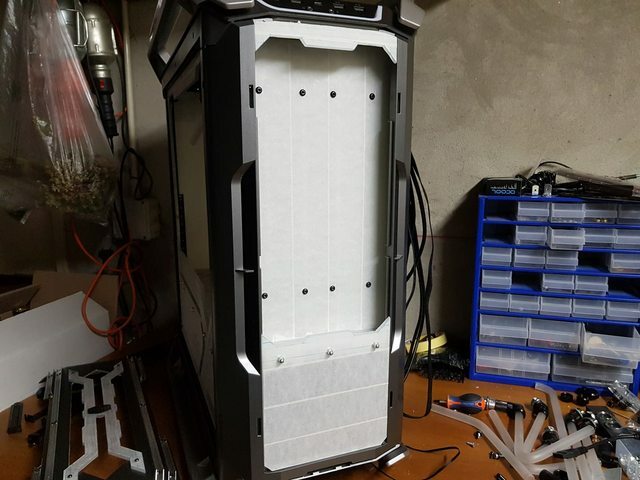 It's time for another big update. 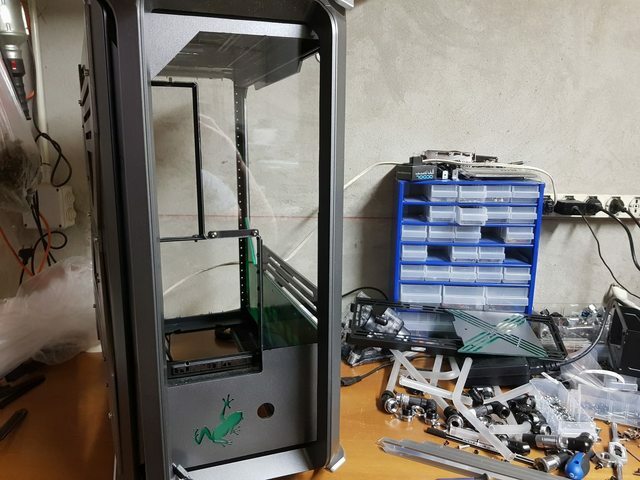 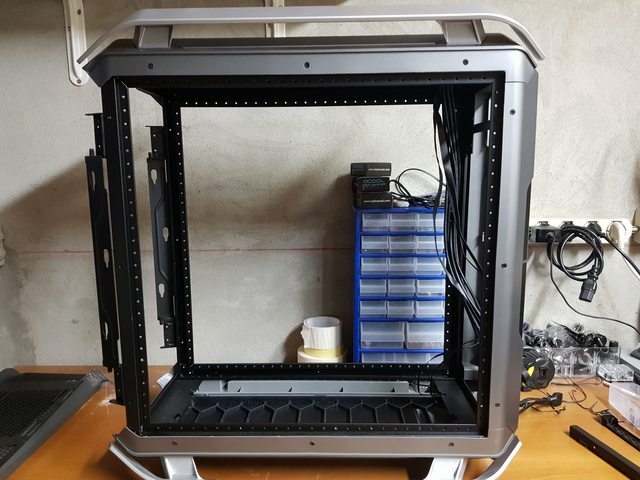 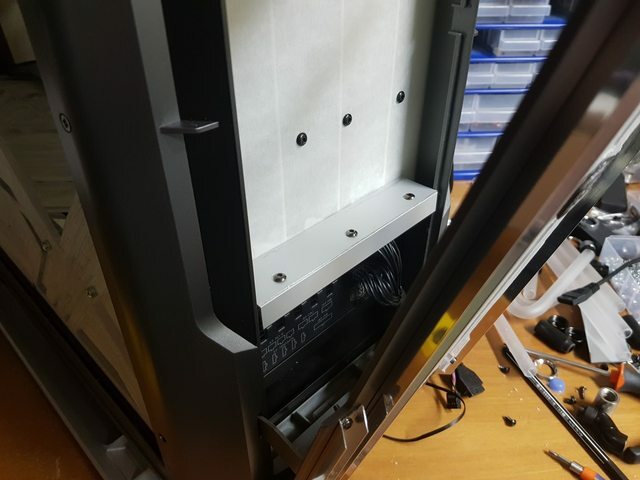 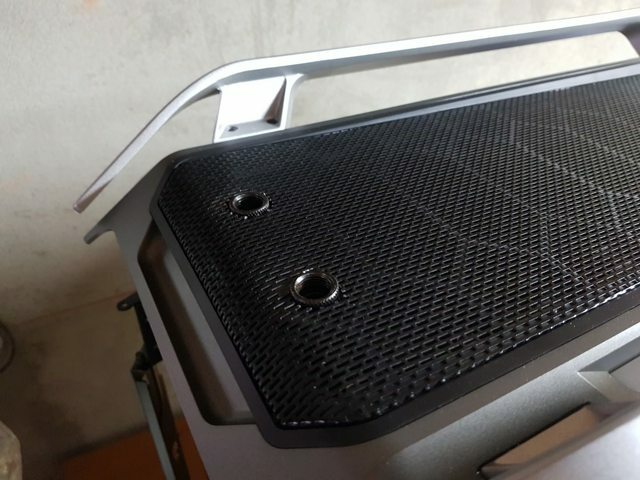 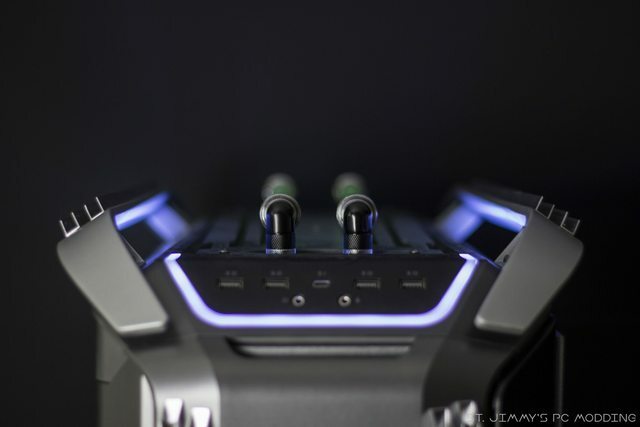 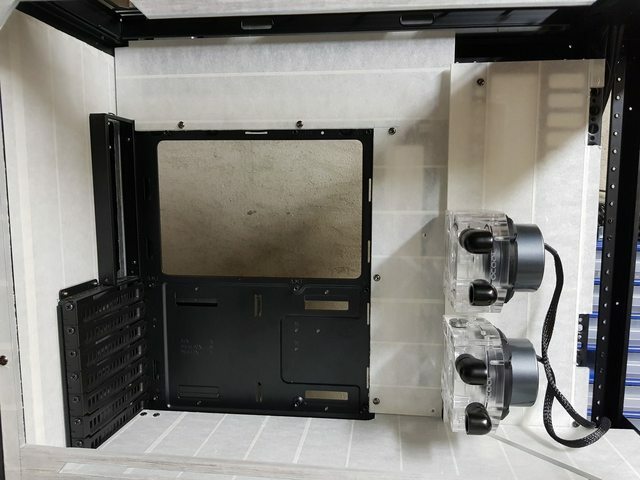 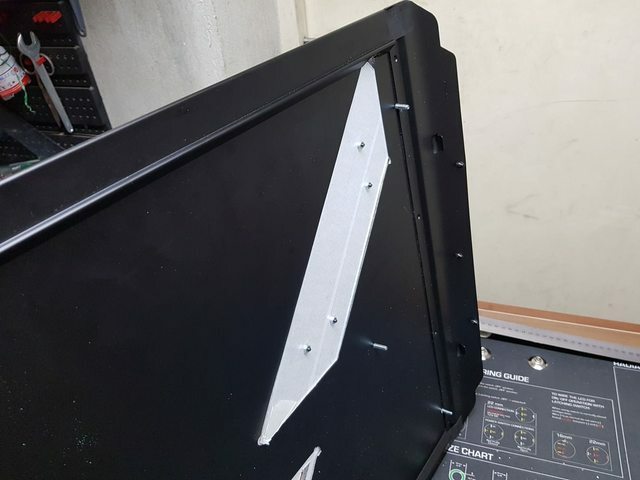 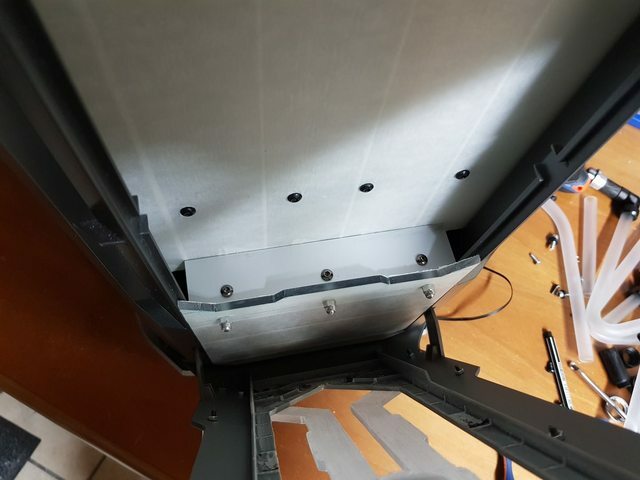 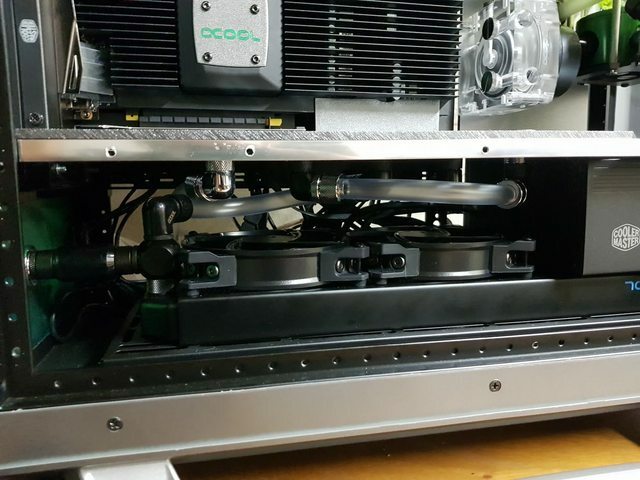 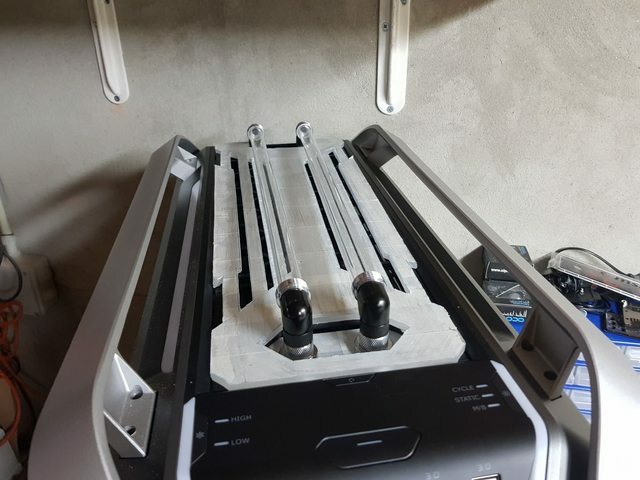 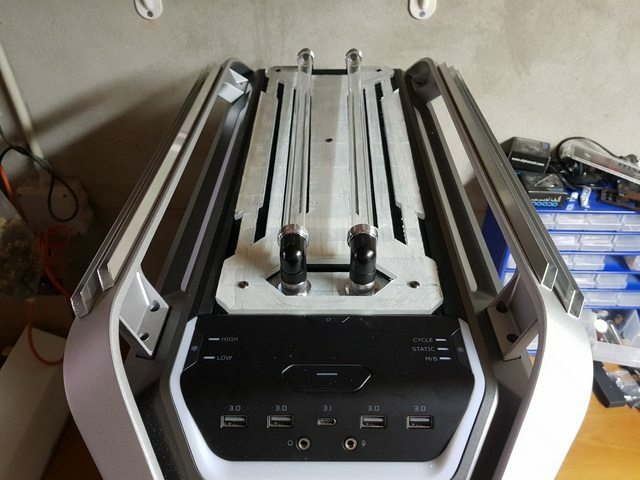 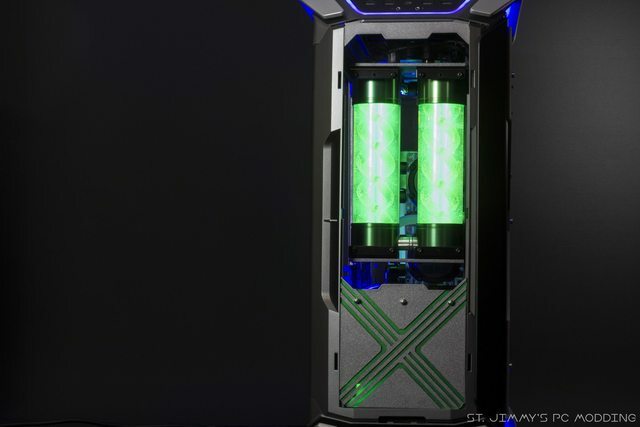 This time we'll take a look at the modding of the reservoirs, to make them nicer and sturdier, a bit of internal panelling and the customization of the front panel of the C700P. 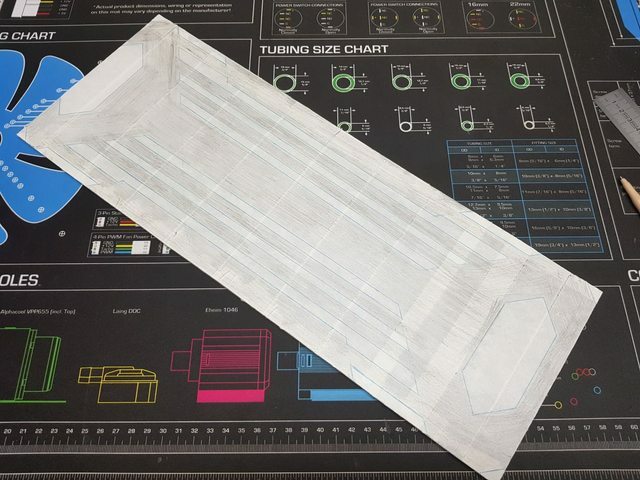 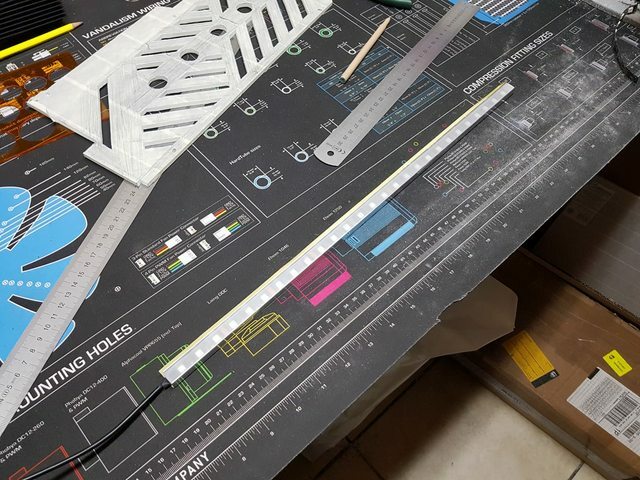 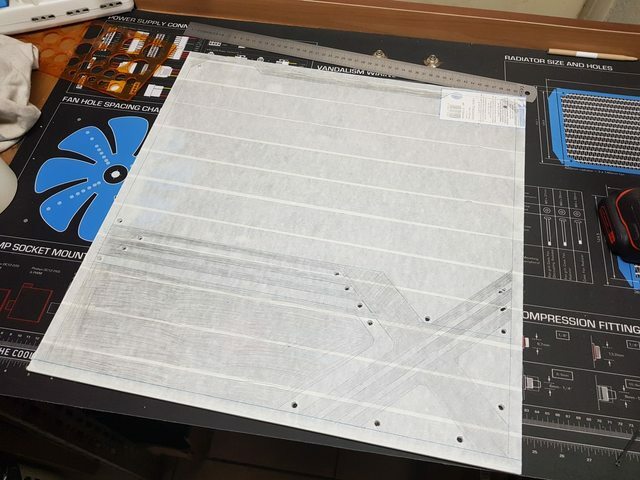 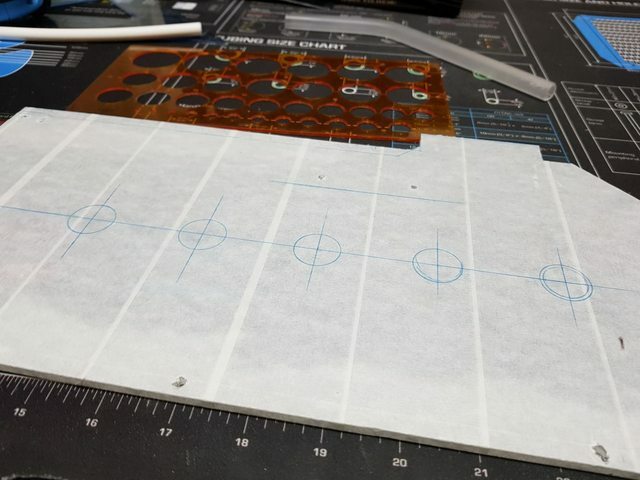 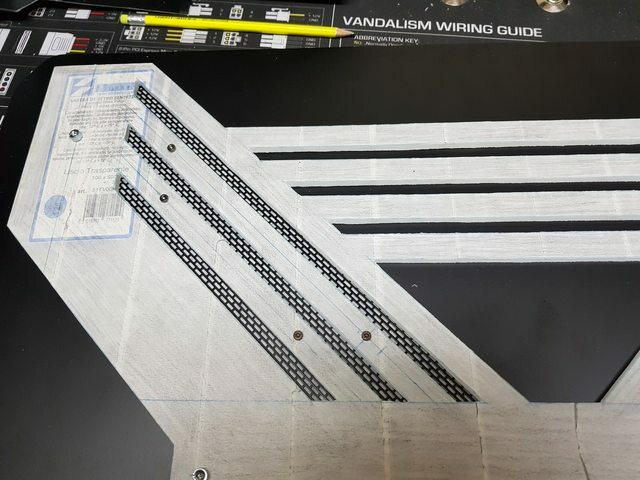 And the last big internal panel is cut as well, now everything is nicely covered and ready for the next step, which is measuring holes for cables and pass-through fittings. 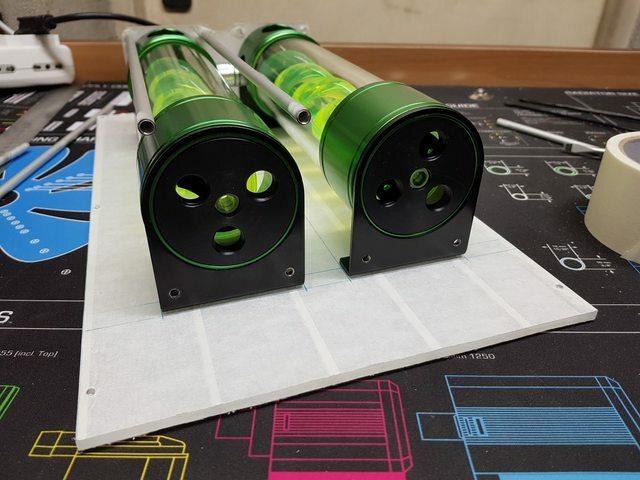 Here we go with another update: top panel mod and first tube runs! 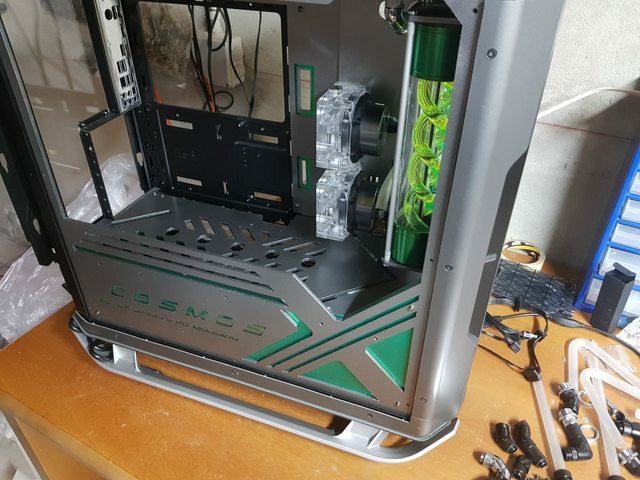 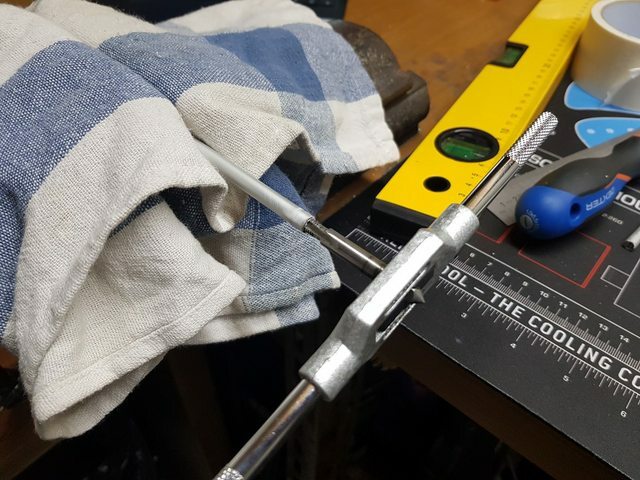 And now to the internal tubes! 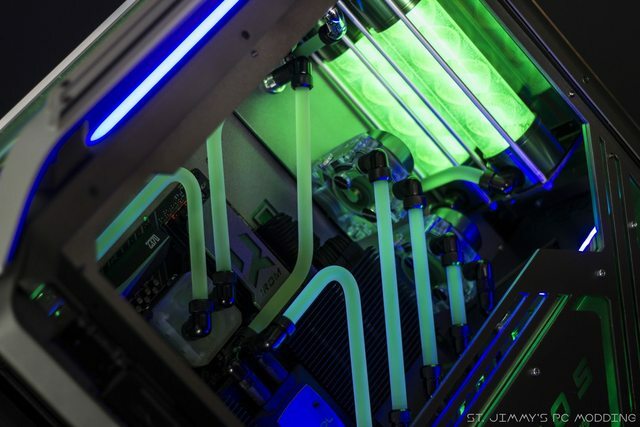 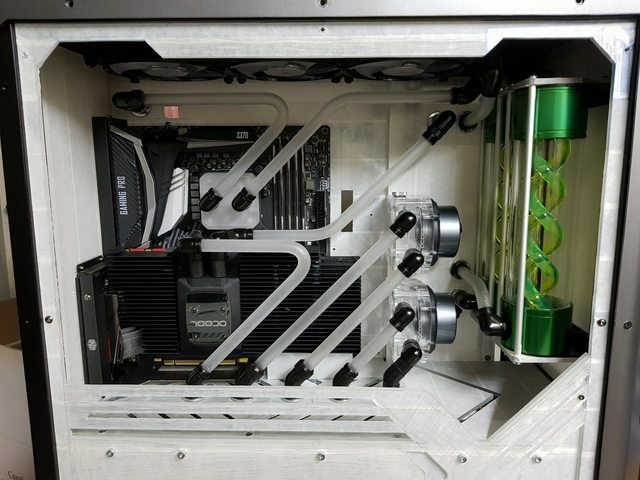 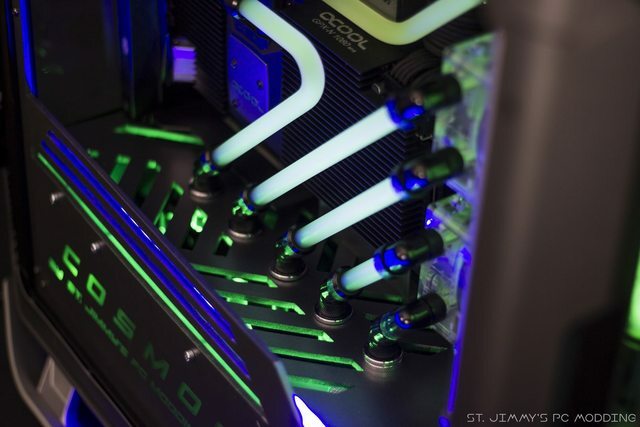 love the matching angles on the tubing! 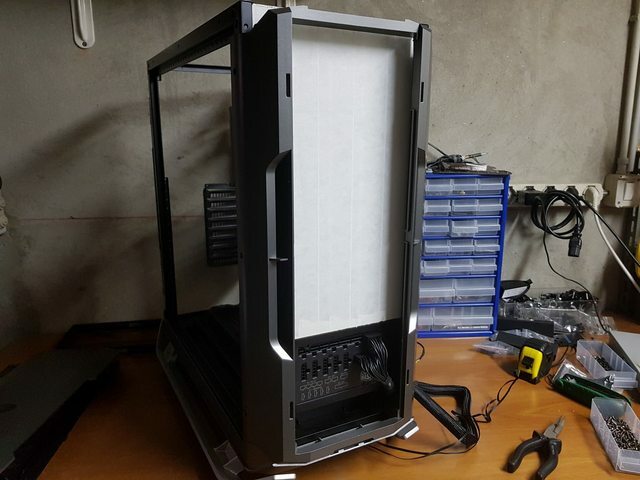 Update time! 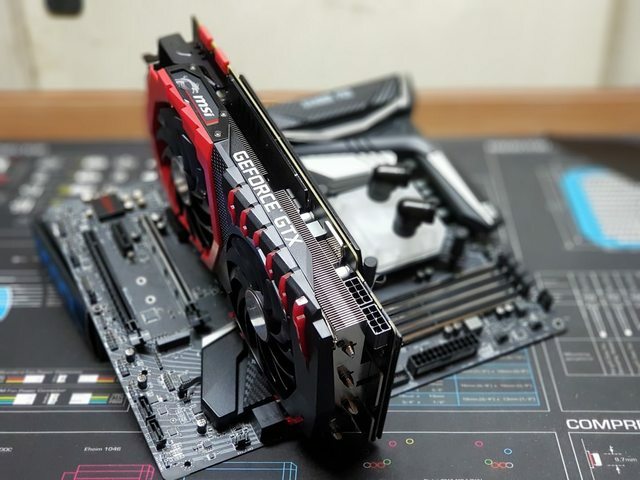 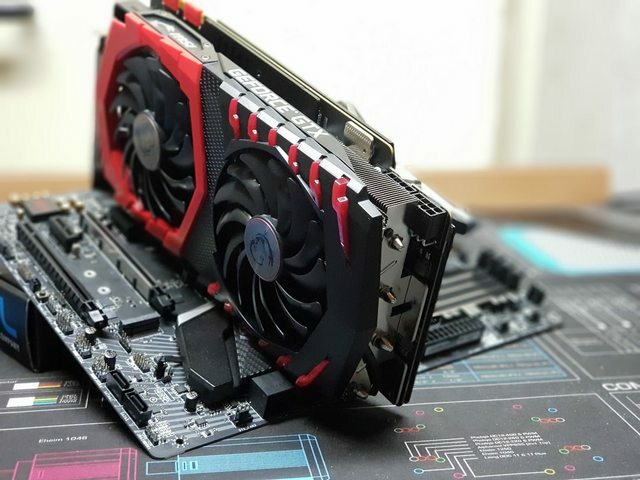 Finally got the MSI GamingX GTX 1080Ti I'll be using for this mod and went on with the modifications. 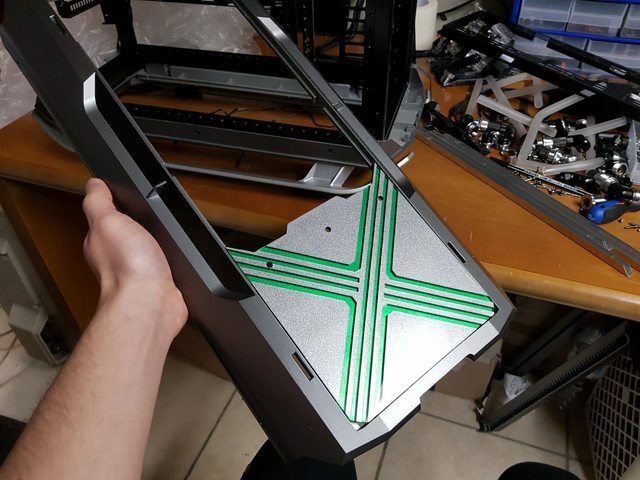 Did a thing with the top handles of the C700P... 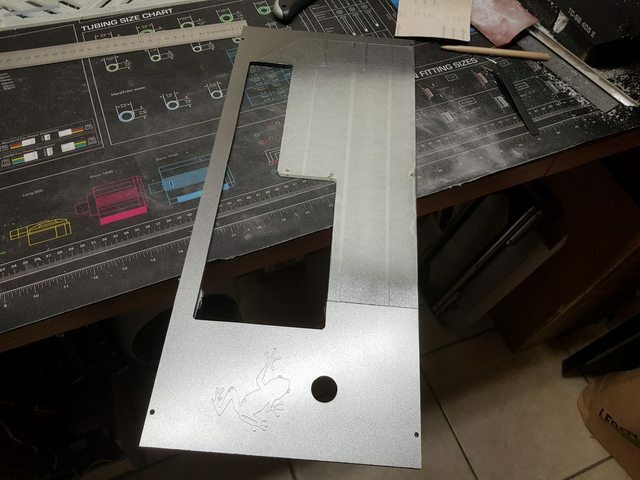 I kept seeing people polishing, brushing or painting them and I just didn't feel like doing the same thing, so I added some aluminum details! 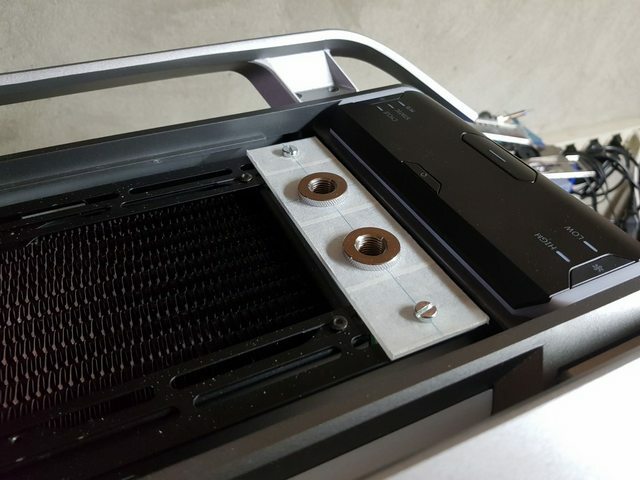 Then cut two openings on the side panel (f**k that was tough, that panel is a beast) as well as two pieces of mesh from the original front dustfilter to put them behind those strips. 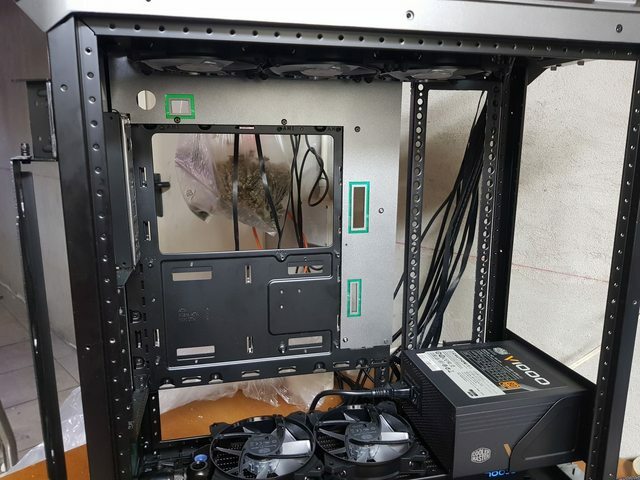 Thank you very much for the feedback man! 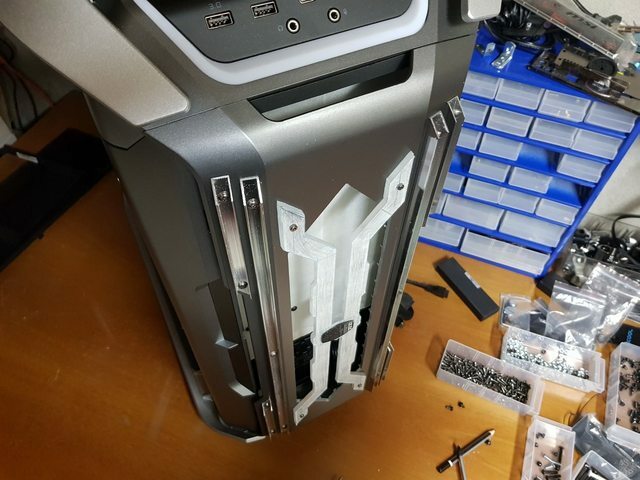 Ok I got a HUGE update for you guys, I must have forgotten to update the threads and ended up with 41 pics to share! 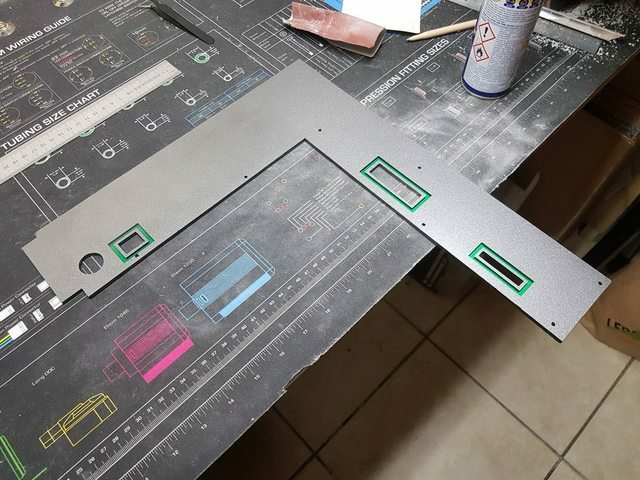 Today we'll see the last panels made, a custom lightbar and almost everything of the paintjob. 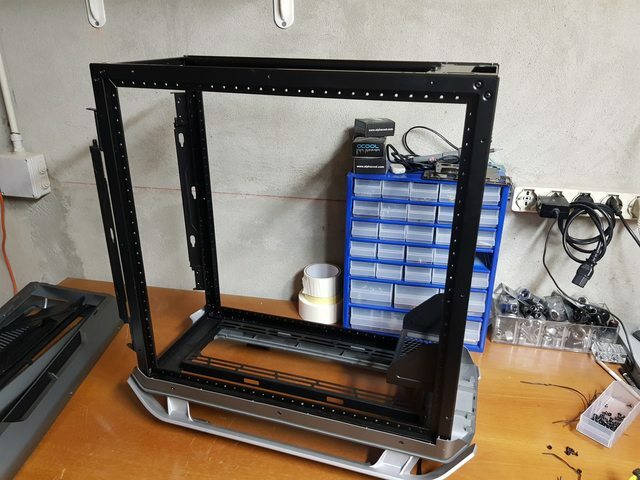 Tomorrow I'm starting the final assembly! 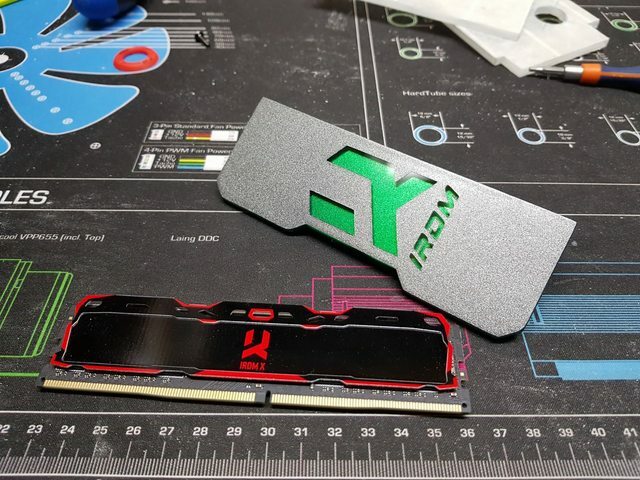 Cover for the GOODRAM ram, which are red and don't fit so well. 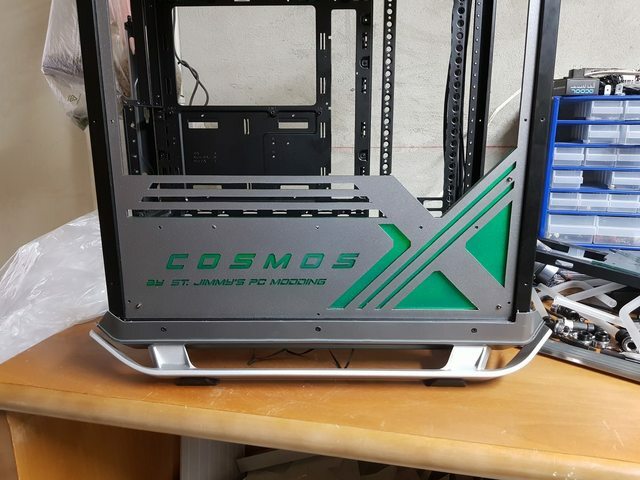 Very close to the end. 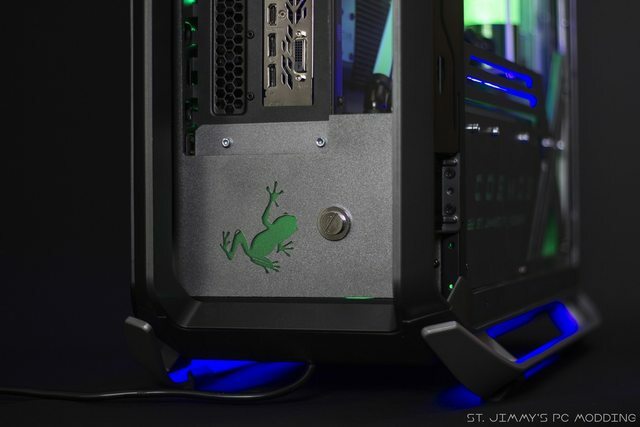 Please hold tight thank you for following! 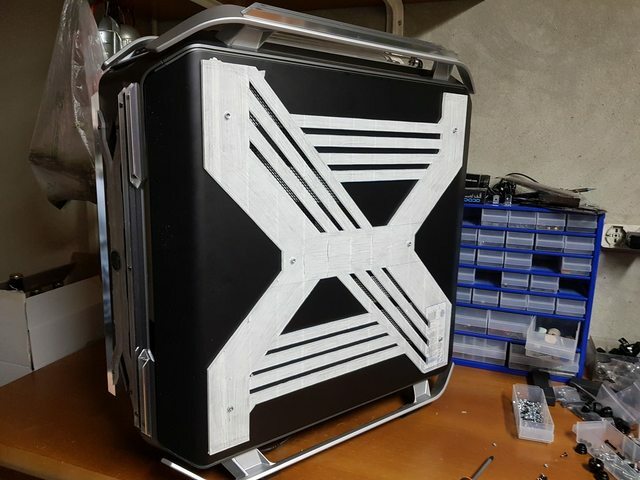 I really love how you studied the X-shapes and the results with the top. 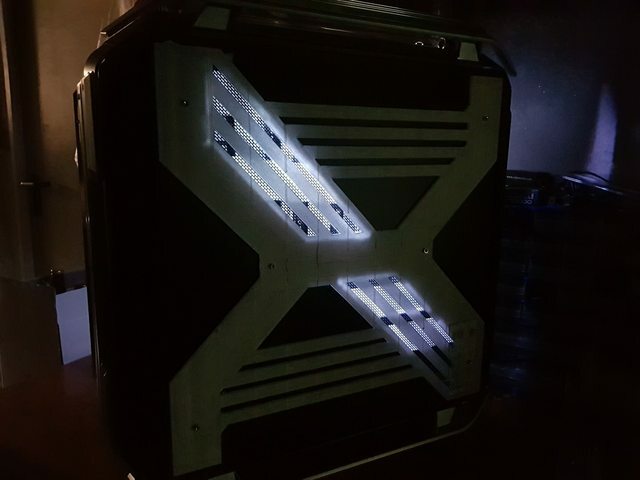 the lighting of the right-side panel, with only half of the X with light result a little dark, i mean, it doesn't show well your work on the panel, but maybe (probably) it's only my impression. 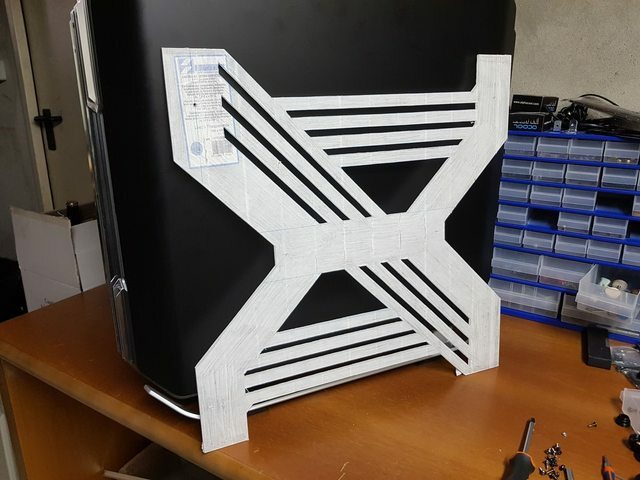 However, Nice work! 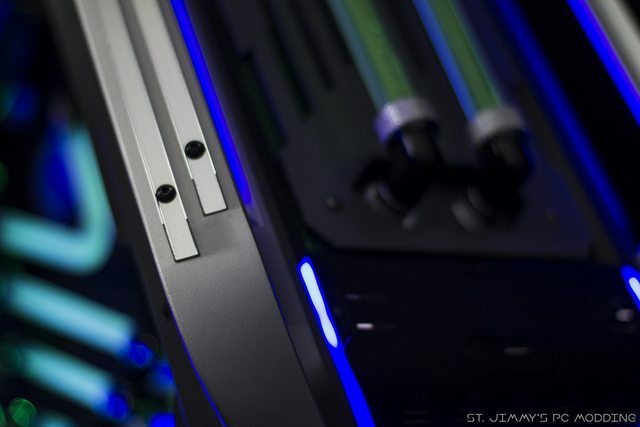 Can't wait to see the final pics! 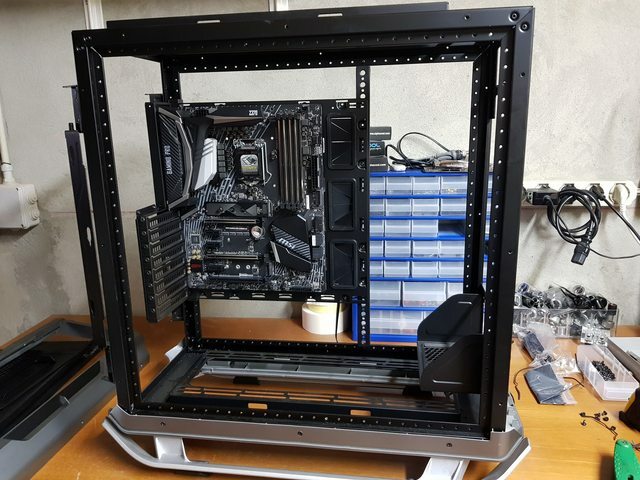 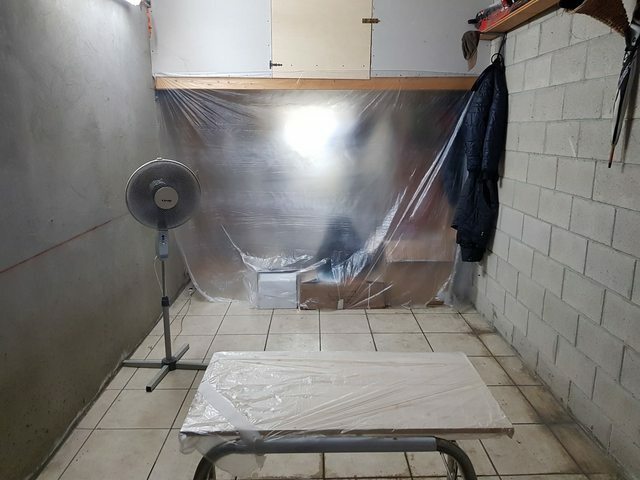 And finally, the last update before the final pics. 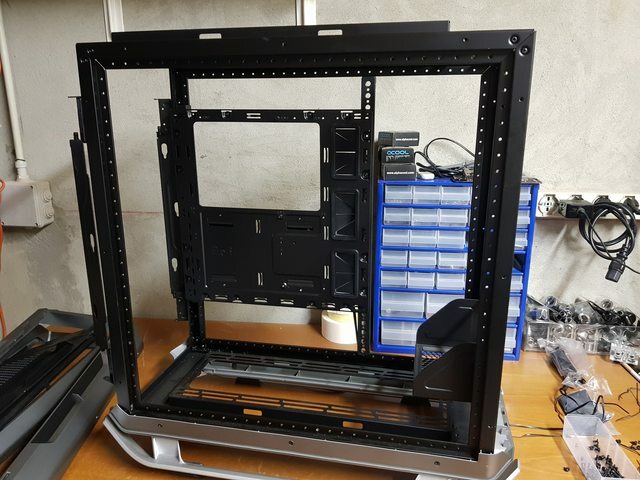 This one will follow the final assembly. 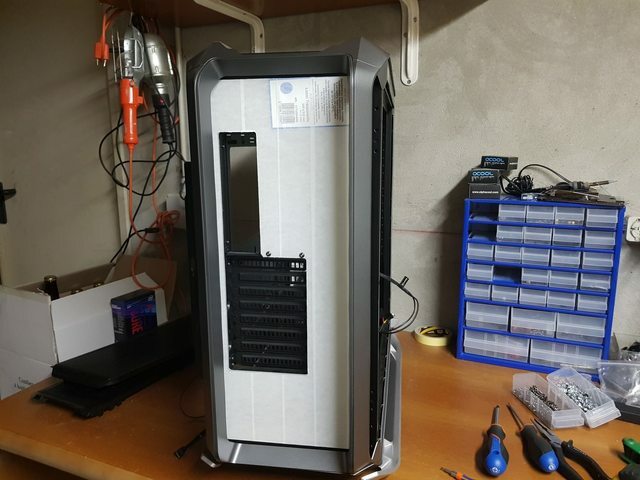 Thank you very much guys! 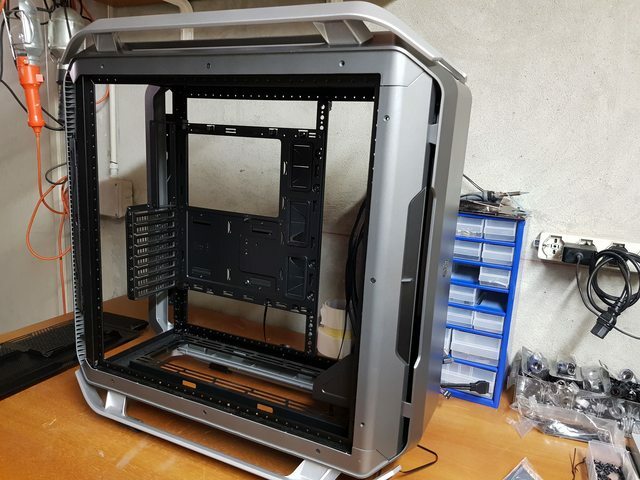 Final pics coming in the next days! 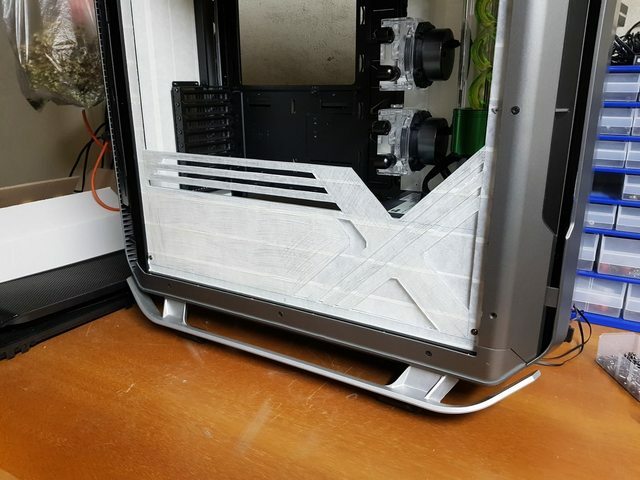 That came out fantastic. 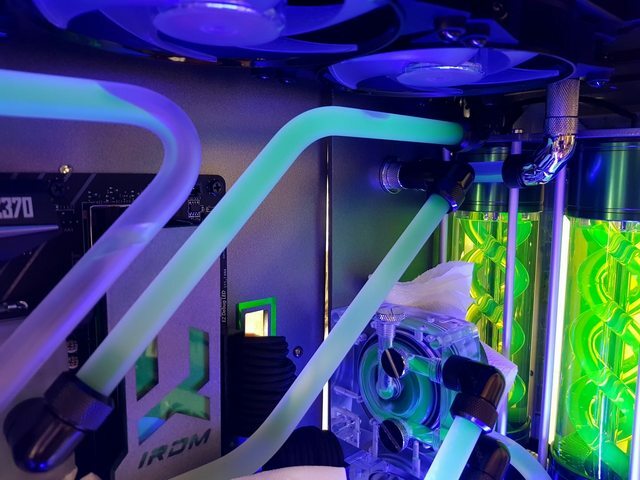 I love your tubing runs in particular. 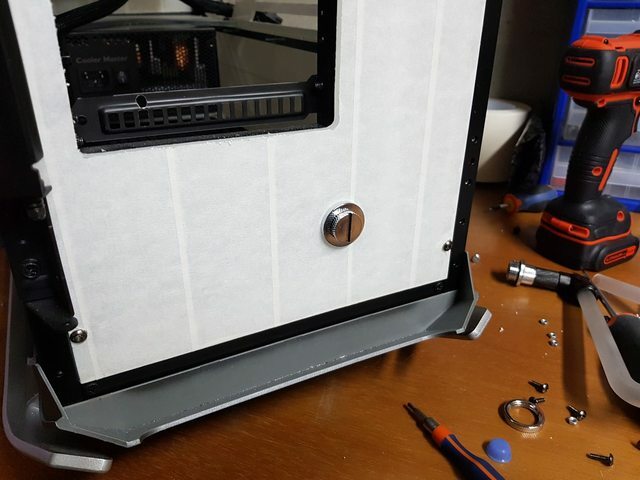 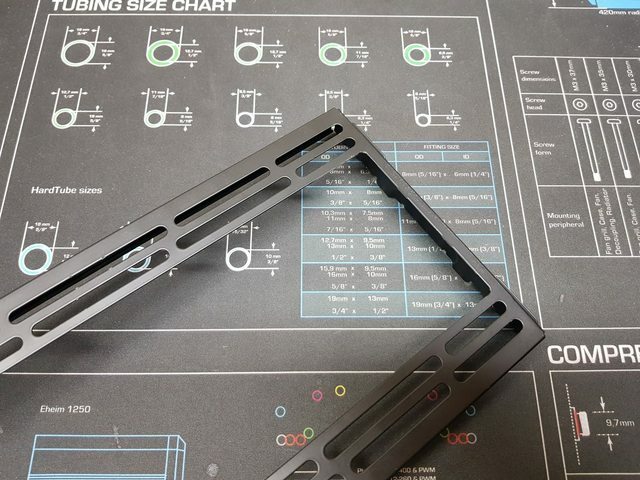 -Lots of nice details on every inch of the case. 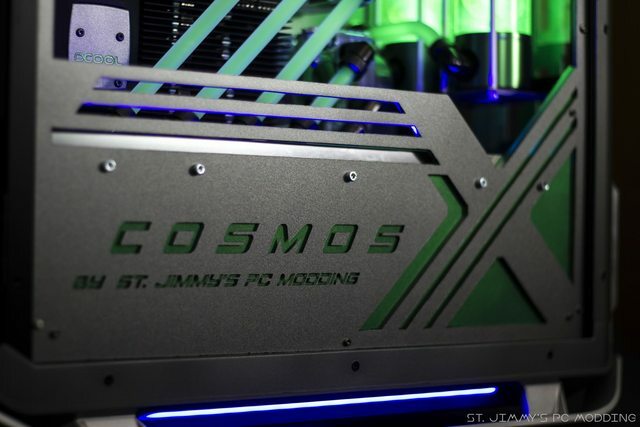 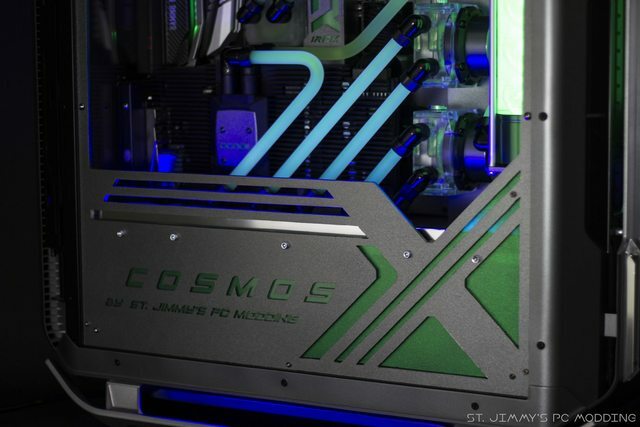 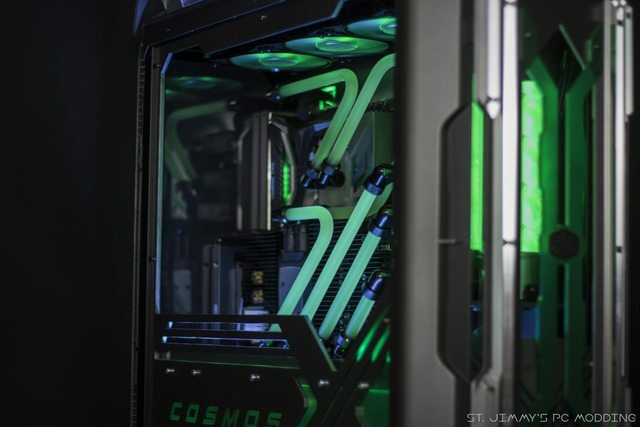 It's finally time to reveal the final pics for CosmosX Project! 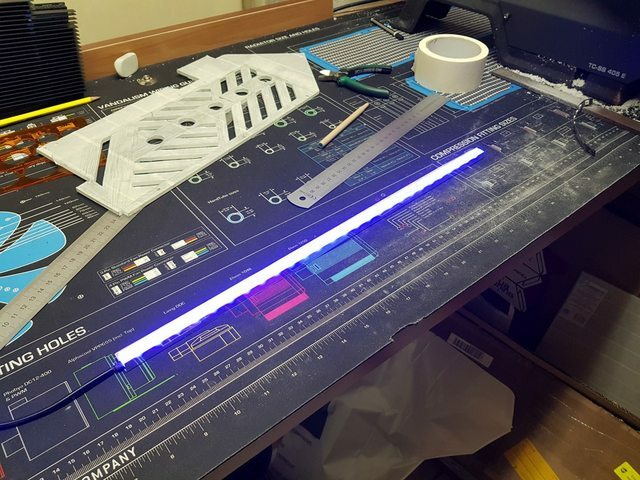 I want to thank everyone for the great feedback, as well as all my sponsors for always giving me the chance to make projects come to life! 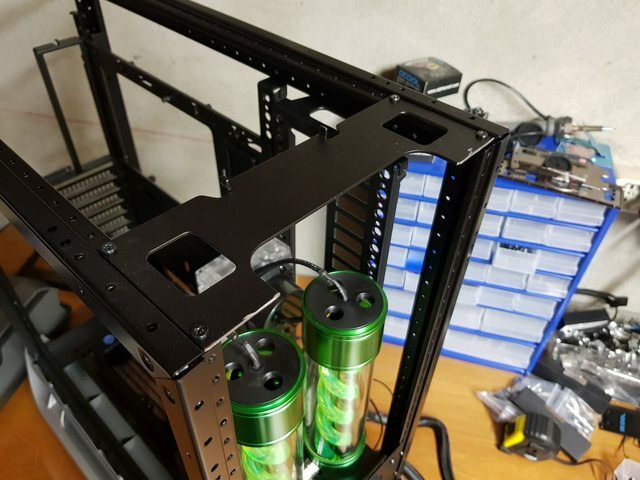 See you at the next worklog! 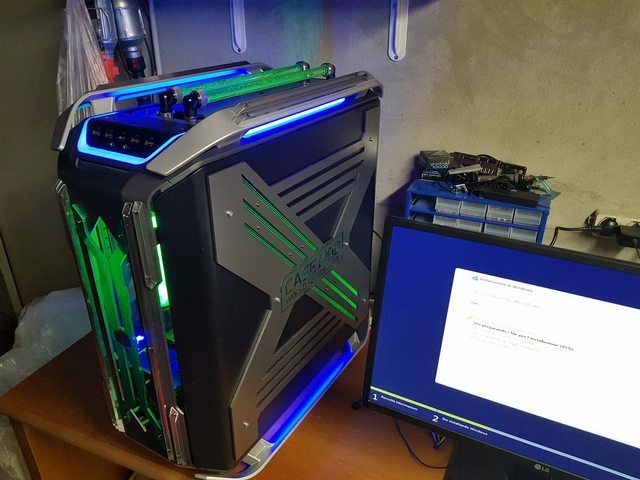 cobalt6700 and _Prometheus_ like this.